PARENT COUNCIL ELECTION OF OFFICERS: MAY 8th at 5:30pm. President, Vice-president, Treasurer and Secretary positions to be filled. PC is an important part of the school support system. 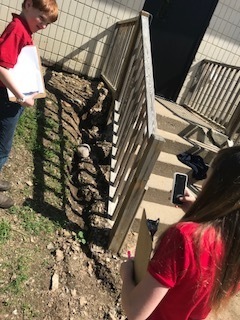 PC meets once a month to plan school related events and fundraisers, vote on and disperse funds to cover all field trips, graduation and class parties, as well as teacher appreciation and Administrative day, any repairs or needs for the school. If you would like to be apart of the PC team or want to learn more about it, please join us Wednesday May 8th! Welcome Haisley! 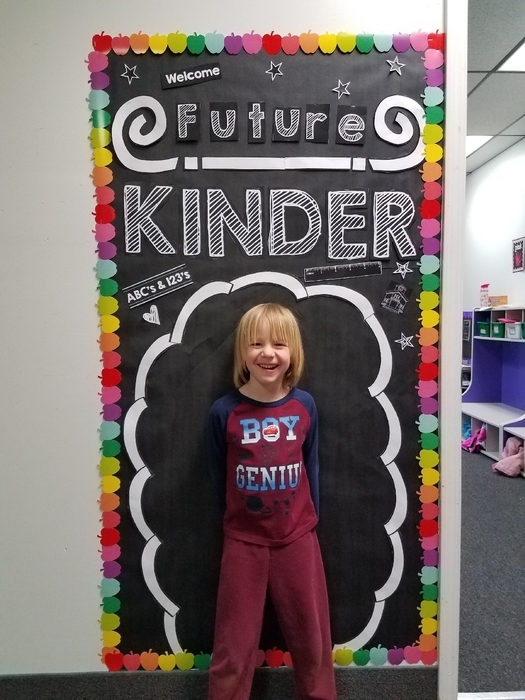 We are so excited to have you in Kindergarten next year! Hey students and parents, student council is hosting an Under The Sea themed dance, on April 26th, from 6-8pm We will be have a form to pre-order tickets which will be due the 25th It is a formal dance, so wear appropriate clothes. The cost for students is $2.00 and is $3.00 for parents. There will be food, refreshments, music, and hopefully you. Staff vs. Students basketball game tonight at 5pm. Come support your favorite team (staff-white, students-blue). Concessions will be available for purchase. All proceeds will go towards new basketball uniforms. Tomorrow night at 5:00pm we will be hosting the HPS Staff VS the Girls & Boys basketball teams. This is to raise money for new Uniforms and Balls. Students are aloud to wear white or blue shirts with casual pants or shorts in support of the team they want to win. They may also tastefully pant their faces as well. If they are not dressed in white or blue in support of a team they must still be in their regular uniform. All players involved can not wait to see you tomorrow at 5:00pm. There will be a School Improvement Committee Meeting tonight at 5pm in the faculty lounge. All parents are welcome to attend. 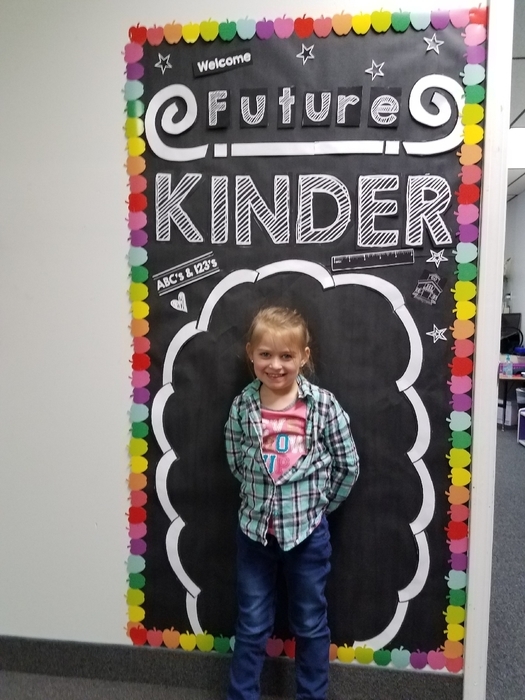 We have been welcoming future Kinders to our HPS the last couple weeks! Dash, thanks for coming to visit! Mrs. Medrano loved getting to know you and can't wait to have you in her class next year!! Just a reminder that the 6th grade Rosa Parks reading projects are due tomorrow. Parent Council meeting tonight at 5:30 in the faculty lounge. Join us to hear about our upcoming events and fundraisers and share any ideas that you may have. 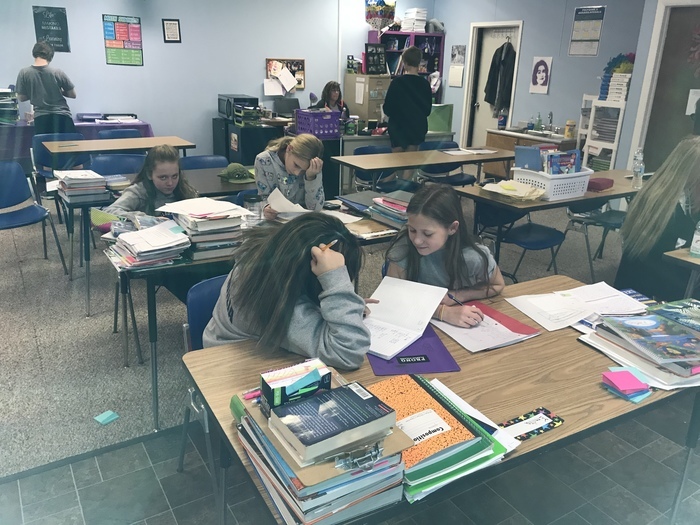 Just a reminder that the 6th grade reading class will have tomorrow and Tuesday to work on their reading projects. Please come prepared to work. 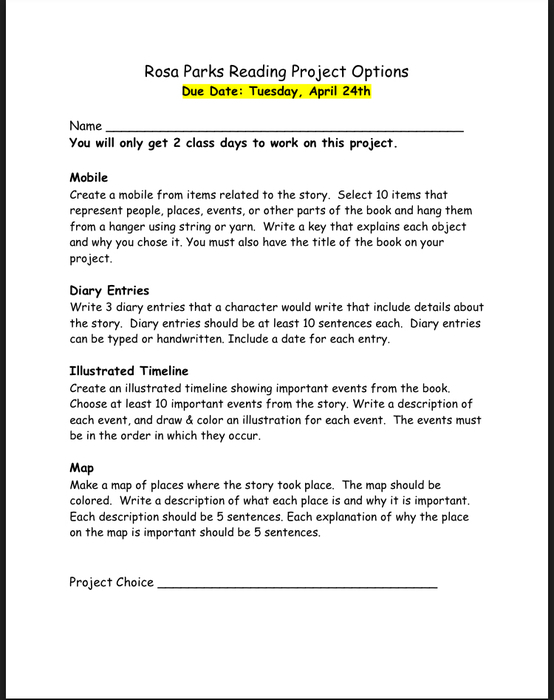 Reading projects are due Friday, April 12th. Mrs. Medrano is so proud of her class! They have read and read and read this month! Everyone has done such an amazing job! The Kindergartners had our book set drawings today and we were so excited!! 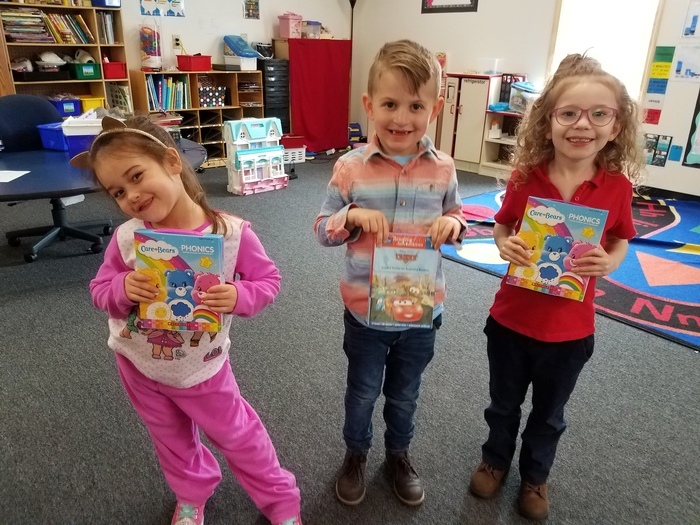 Congrats to Raistlyn, Mason and Zoie for winning their new book sets!!! Upcoming Events & Reminds: *Today at 1pm, students will be wrapping up One Book, One School by watching the movie as a school. Parents are welcome to join us in the gym! *There will be an assembly tomorrow at 1:30 presented by Michigan Avian Experience. The students will see and learn about real raptors and birds of prey. *Report cards will be sent home with your child tomorrow. Please look for those and contact your child's teacher with any questions. *Tomorrow is casual day! Students may also wear pajamas to curl up with a good book. *There is NO after school program tomorrow, 3/29. Dismissal is at 3:15. Please plan accordingly. *Spring Break is April 1-5. School resumes on April 8th. March is reading month! Don’t forget to dress like your favorite character from a book tomorrow. If you do not dress up, you should be in uniform. Have a great night! On Monday, March 25 we have our first annual STEM Night from 5:00-6:30. We are in need of pies for the event. If you are willing to donate a pie please drop it off during the day on Monday. Don’t forget that the book fair in the upper building will have extended hours tomorrow, Thursday the 21st, from 3:45-5 pm. The book fair will have extended hours today until 5 pm and Thursday from 3:45-5 pm. The book fair is located by Mr. Bob’s office and the 1st grade room. On Wednesday, March 27 we are hosting an event for upcoming Kindergarten students who have a sibling at HPS. 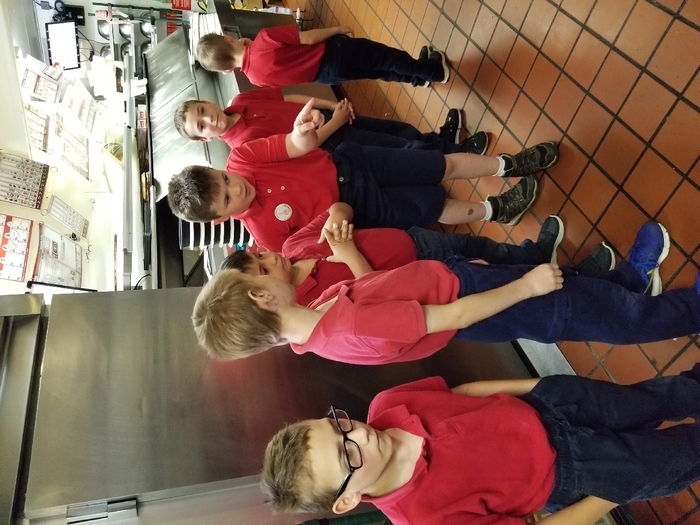 They are invited to come eat lunch, take a tour and spend some time in the classroom. They will even get to attend recess with their siblings. The event will take place from 11:50 - 1:50. Please contact the office to sign up. We can't wait to meet the next generation of HPS Students. 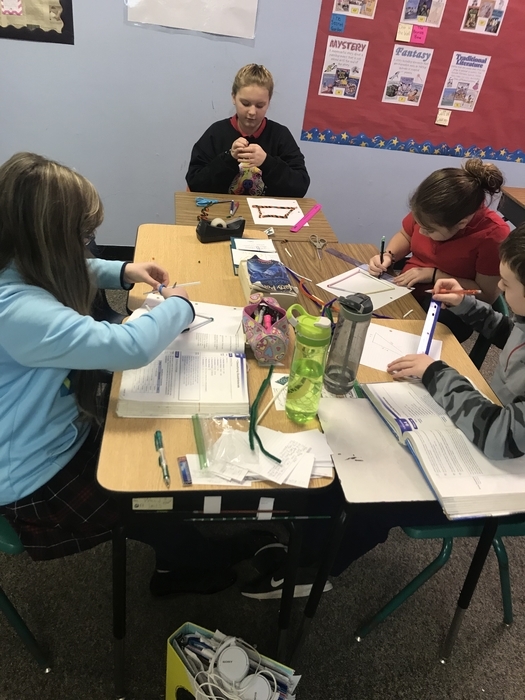 Happy Pi Day from Mrs. Wallace’s math class! 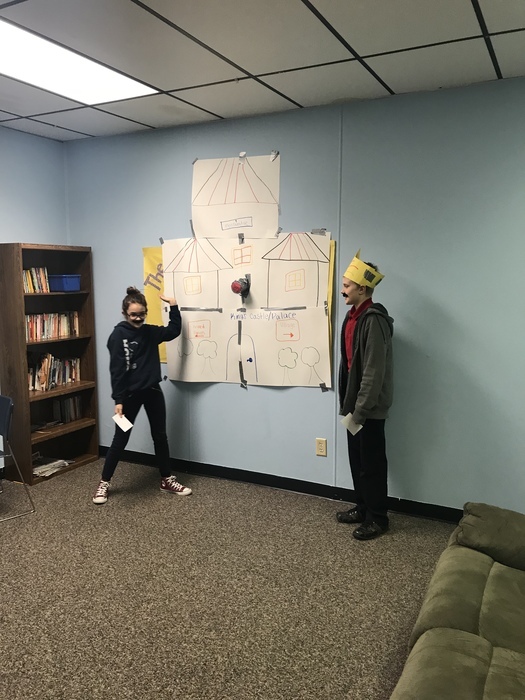 At the beginning of the week, the 6th grade math class was able to create their own quadrilateral building and explain what type of quadrilateral their building was and why. This year our school will be hosting an Usborne Book Fair starting Monday, March 18th through Friday, March 22nd. A display will be set up for kids to make a wish list. A catalog is also being sent home today. Orders can be placed online or at the school. If you have your order sent to the school you will receive free shipping. Please read the letter being sent with the catalog for more information. The minute to win it Challenge has been rescheduled to next Friday 3/15. The challenge will be right after opening for February students of the month. Don't forget to stop in the Small Town Sweet Boutique this week. 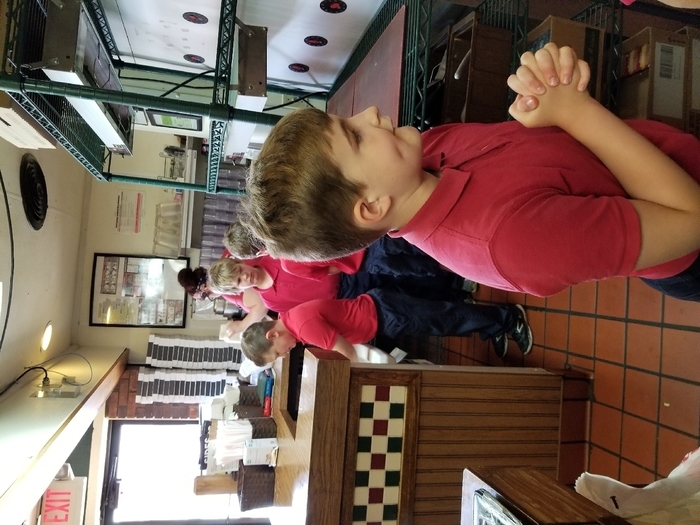 If you present them with the coupon sent home last week 20% of your purchase will be donated to HPS. There are extra coupons in the office if you need one. Our lost and found pile is growing by the second! Please stop by and look at it this week. On Friday all items will be packed up and donated. 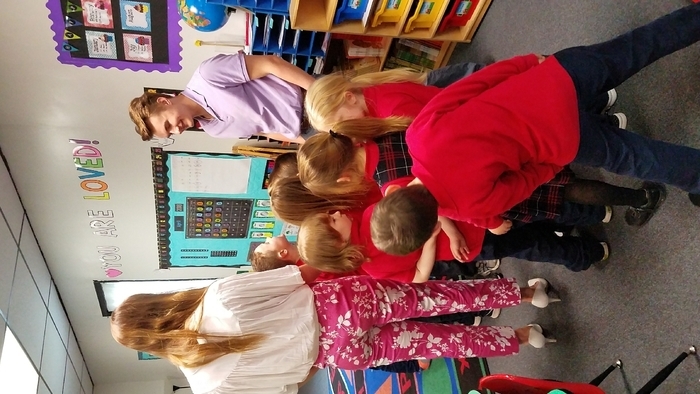 Hillsdale Prep students enjoyed a wonderful presentation from The Heritage Association Winona Legends Youth Council. Student authors and Illustrators read their book called The Legends of Winona: A Special Gift. If your child would like a copy of the book shared today, but didn't preorder, there is still time. Books are $10. Orders can be sent to the office until Wednesday March 6th to receive a signed copy of the book. Good afternoon, I am sending out this message to let all parents know that I have sent home in a envelope directed to you a progress report for the 3rd quarter. It shows the grades they have received on all assignments up to this point. Anything that is highlighted in yellow shows a zero because of not being turned in. Feel free to reach out to me regarding any questions you may have. Small Town Sweet Boutique is helping us raise money for our Literacy Program. We are sending a coupon card home with every family today. If you bring that coupon in to the Small Town Sweet Boutique 20% of your purchase will be donated back to HPS. The coupon is valid through March 9th. On Friday, March 1, The Heritage Association Winona Legends Youth Council is putting on an assembly at HPS. They will be presenting the book they wrote about the daughter of Chief Baw Beese titled "A Special Gift." An order form for the book was sent home yesterday. The book is $10.00 and all of the proceeds go to bronzing the statues of the black bears that will be placed on the Baw Beese Trail. Please have the order form along with the money turned in by Thursday. The due date for 6th grade reading class project for The Bronze Bow has been moved to Monday, March 4th. Come celebrate reading at our 3rd annual Literacy Night tonight from 5:00-6:30! Forgot to bring your book exchange books to school today? No worries! Bring them tonight!! Students who attend tonight will be allowed to wear casual clothes tomorrow!!! Don't forget to come to Literacy Night Monday from 5:00-6:30! Let's celebrate how SWEET reading is! 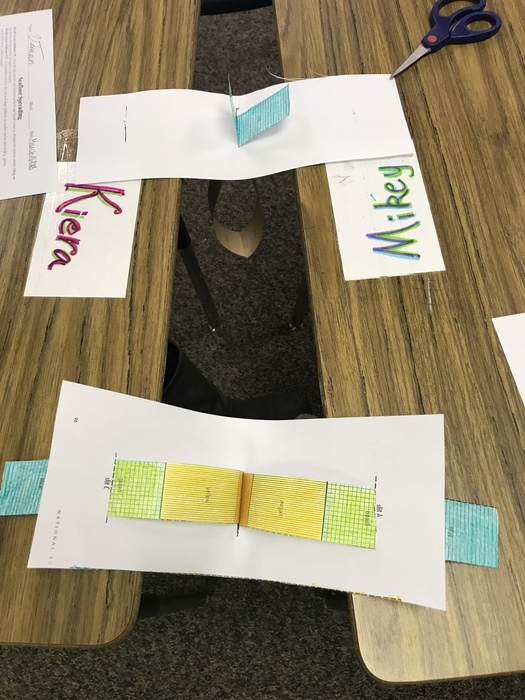 Students will have a great time reading and doing activities! We will have Leaders in our community as special guests and a book exchange! Mark your calendars and don't forget to bring your book for the book exchange during school hours Monday! Students in attendance will get to wear casual clothes Tuesday! A friendly reminder that tomorrow is casual day. 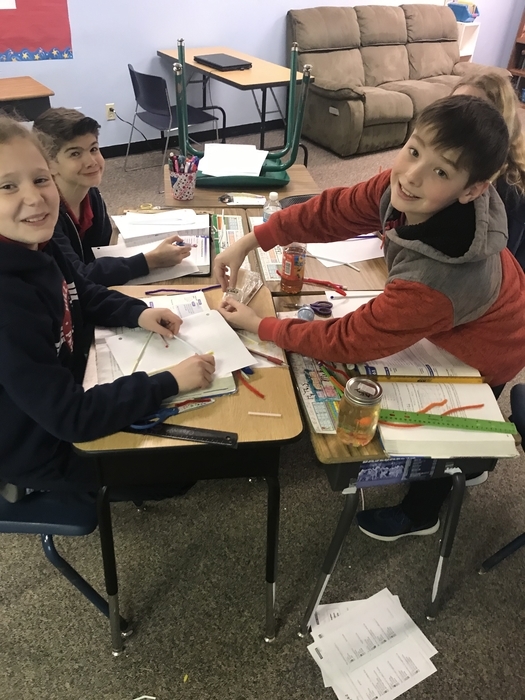 Updates and Reminders *Tomorrow is swimming for grades 3-8 *The home basketball game tomorrow is at 6:00 PM *Friday is casual day *Literacy Night is Monday from 5:00-6:30. A flier with more information was sent home yesterday. *A letter is being sent home today with information about bad weather make-up days. *There is a Girl Scouts Meeting tonight for girls in grades K-5 from 3:30-4:30 in the staff lounge. Reminder- There is no school on Monday for President's Day. The School Improvement Committee meeting originally scheduled for 2/13 has been rescheduled for Wednesday 2/20 at 5pm. Parents are welcome and invited to attend. Hillsdale Preparatory School will be closed on Wednesday 2/13. Hillsdale Preparatory School will be closed Tuesday 2/12 due to icy road conditions. If you are interested in buying Candy Grams please turn in your slips as soon as you can. Thank you to everyone who has already purchased candy grams and to everyone who donated! Thanks!!!! Update: Hillsdale Preparatory School will be close on Wednesday 2/6. There will be a 2 hour delay on Wednesday 2/6. Doors open at 9:30 and Opening Ceremony will begin at 10:15am. There will be no morning program. Student Council Candy gram forms are being sent home today! If you’re interested in purchasing for your kids or classmates please fill them out and attach the money, if you have any questions please contact Student council. We will also be selling at the snowball dance so feel free to ask questions or purchase there! Extra forms will be in the office. Thank you!!!!! Due to the amount of snow days we have made a change to our mid-winter break. There will still be a half day on Thursday, Feb. 14 with conferences from 1-6. On Friday, Feb 15 there will be a half day with 12:00 dismissal. If you need help with child care on the 15th please contact the office. There will still be no school on Monday, Feb. 18. 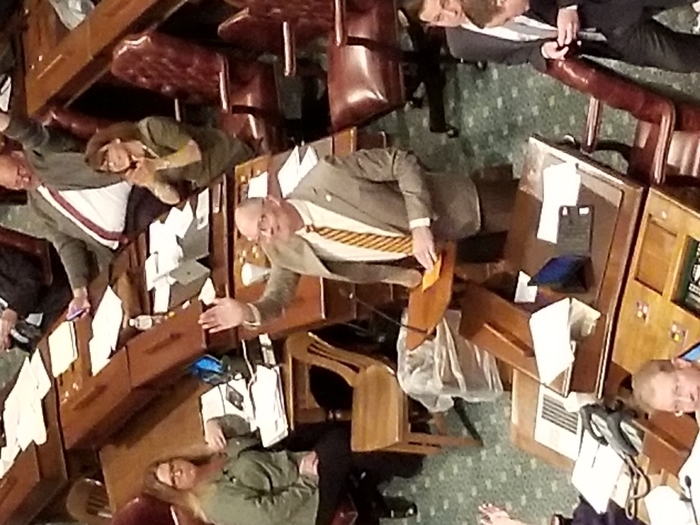 Thank you for your understanding while we work to be in compliance with the State of Michigan. Update: With dangerously cold temperatures and wind chills predicted through Thursday, Hillsdale Prep will remain closed on Wednesday 1/30 and will also be closed Thursday 1/31. Please stay safe and warm. 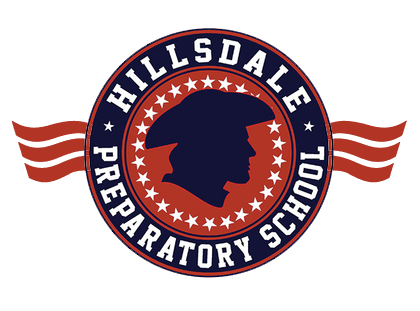 Hillsdale Preparatory School will be closed Tuesday 1/29 and Wednesday 1/30. Please be safe and stay warm! Hillsdale Preparatory School will be closed Monday 1/28. Hillsdale Preparatory School will be closed Thursday 1/24 due to road conditions. Hillsdale Preparatory School will be closed Wednesday due to icy road conditions. There will be a parent meeting on Wednesday at 6pm for girls interested in Girl Scouts. Please see the attached flier. 6th grade will be NWEA testing tomorrow & Thursday. Please make sure your child is well rested & has a good breakfast on testing days. Also, we will be doing a project & we need magazines! If you have appropriate magazines you would like to donate, please have them in by Friday. Hillsdale Preparatory School will be closed Monday 1/21 due to extremely cold temperatures and unimproved road conditions. Non-perishable foods will still be collected on Tuesday for the canned food drive. Hillsdale Preparatory School will be closed Monday 1/21 due to extremely cold temperatures and wind chill. Items for the canned food drive will be collected on Tuesday. We have extended the canned food drive until Monday. Mr. Trumbe's class is currently in the lead. The class that has the most canned goods by the end of the day Monday will win a classroom party. Students of the Month will be participating in Minute to Win It activities today after opening. Don’t miss the fun! Reminders: No school Monday, January 14 We do have school on Monday, January 21 The canned food drive is next week. The class that brings in the most canned goods will win a prize. 2nd Quarter report cards were sent home today. Please check your child’s backpacks and folders. 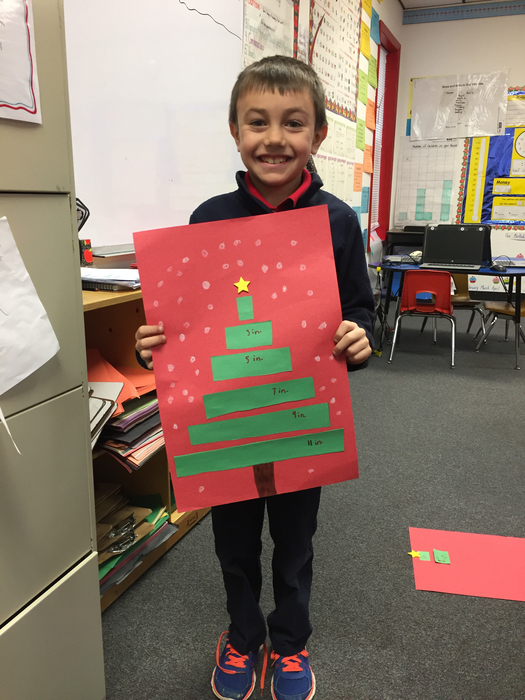 Mrs. Fowler’s class will be shopping at the Christmas shop tomorrow (Thursday). Please send money in a marked envelope with your child’s name on it. Just a reminder, 6th grade book reports are due TOMORROW! This is for all 6th grade students. Next week is the annual Holiday Gift Shop. The schedule has been posted on our website. Every class will visit the gift shop twice. The first time they will make a wish list. They will bring home the wish list along with a money control envelope. The second time they will be allowed to shop for items on their wish list. Your child will only be sent back a second time if they bring money. Thank you so much to everyone who donated toys for our Toys for Tots drive! As a school we were able to collect 363 toys to help our community! 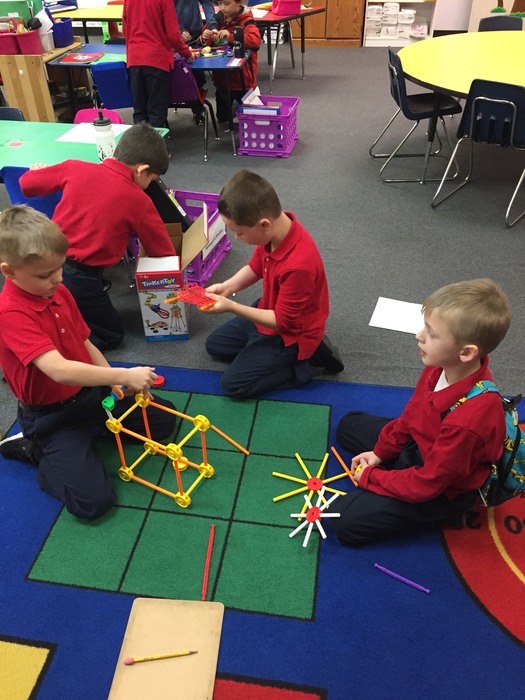 Mrs. Kuenzer's class was the winning class with a total of 153 toys and Mrs. Wallace's class came in 2nd place with a total of 115 toys. Tomorrow will be the last day for toy donations for Toys for Tots. Friendly Reminder: Tomorrow is picture retake day! 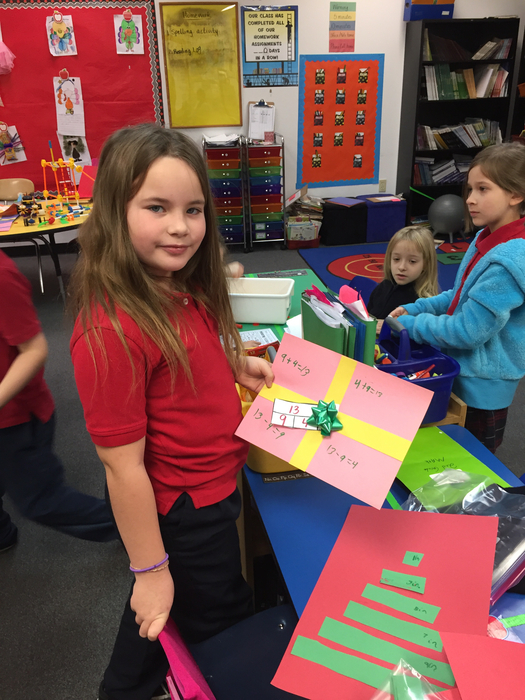 Mrs. Wallace's & Mrs. Kuenzer's classes are currently tied for 1st place in the Toys for Tots drive. Wednesday, December 5th will be the last day to collect new & unwrapped toys for the drive. Thank you so much for all those who have already donated! We have over 100 toys so far! Next week will be the last week to collect toys for our Toys for Tots drive. Please make sure all donated toys are new, unopened, and unwrapped (not wrapped in wrapping paper) toys. Thanks to everyone who has already donated! 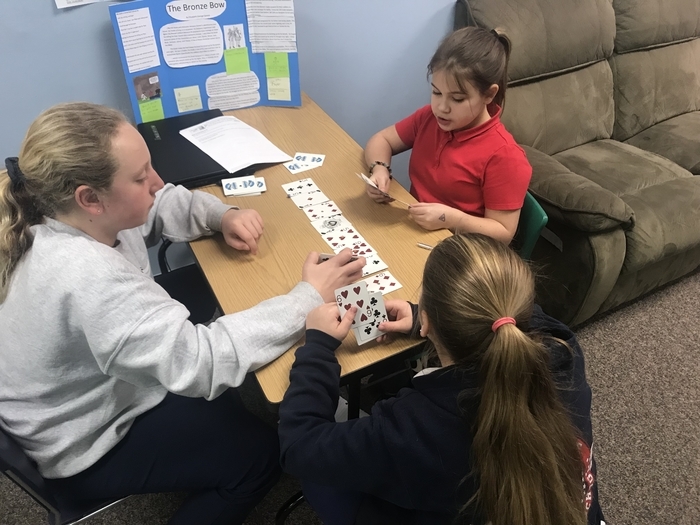 Mrs. Kuenzer's class is currently in the lead. Friendly reminder: Tomorrow is casual day! Due to weather conditions, Hillsdale Prep will be closed Monday 11/26. The morning program is cancelled. Reminder: Tomorrow is a half day of school. Dismissal will start at 12:00. There will be no lunch or after school. Thank you to everyone who donated returnables to the bottle fundraiser for the 8th-grade trip. The class made $386.70. Just a reminder that 6th grade book orders are due tomorrow. Tomorrow is our annual Thanksgiving Lunch provided by Parent Council. They will be serving french toast and sausage. 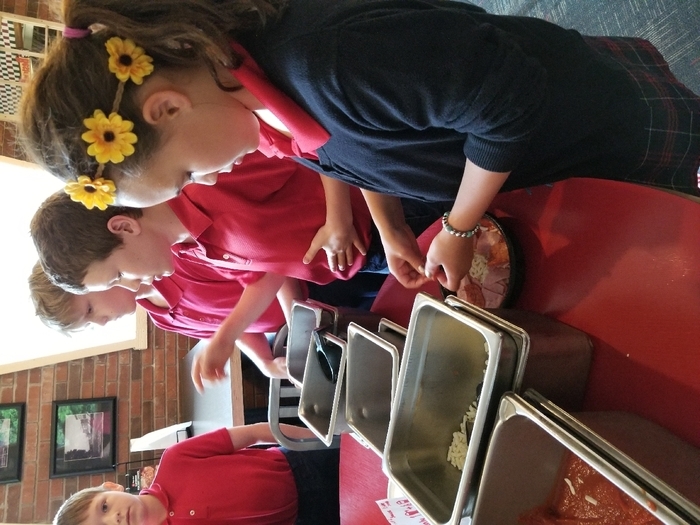 Students will have an extended lunch to make sure everyone has time to eat. Lunch will take place from 11:50-12:45. We can always use volunteers for this event. Cooking will begin at 9:30 and we will need volunteers all the way through clean up at 1:00. We are looking forward to another great Thanksgiving Breakfast. We will accept any last-minute spirit wear orders during the day today. Please have all orders turned in by the end of the day. Due to declining road conditions, swimming for grades 3-8 has been cancelled. All after school activities will also be cancelled. This includes basketball practice and the after school program. Afternoon dismissal will begin at 3:00, instead of 3:15. You may use your discretion in picking up your children before the end of the school day. However, we ask that you do not pick up students between 2:30 and 3:00 so that we can keep dismissal of students safe and orderly. The office will remain open until 4:00pm. Goat Milk Soap! The 7th and 8th graders are selling Goat Milk Soap as a fundraiser for their 8th-grade field trip. If you would like to purchase some see a 7th or 8th grader. You can also purchase some in the office as Melody has an order form. Thank you for your continued support. 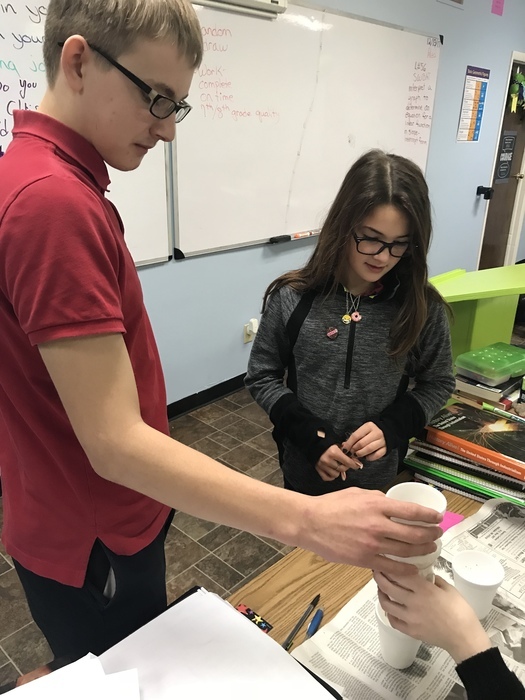 The 8th-grade class is holding a bottle fundraiser. 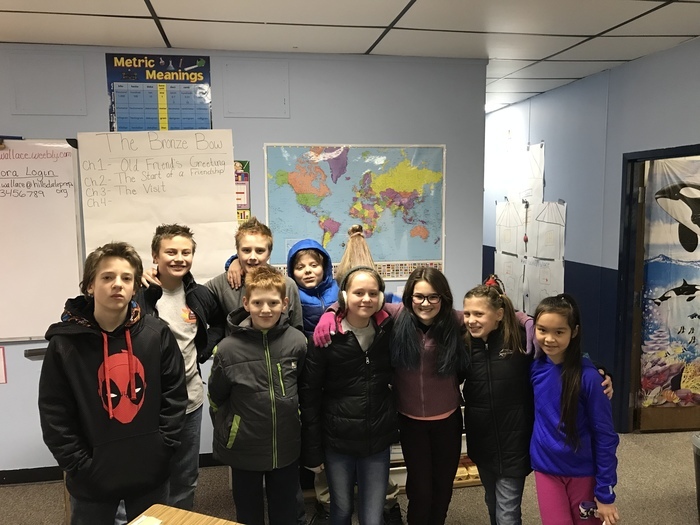 They are raising money for their 8th-grade field trip to Gettysburg PA and Washington D.C. Returnable cans and bottles can be dropped off at HPS from November 12th - November 16th from 7:30 - 3:45 and on Saturday, November 17th from 8 A.M. till 10 A.M. Please place the returnables in a bag before you drop them off. Thank you for your support. Dial-a-Ride will be closed on Monday, November 12. The Parent Council meeting has been rescheduled for next Wednesday 11/14 at 5:30. Nominations will be accepted and voting for the vacant Vice President position will occur at this meeting. Come on out and show your support. Join us today at 2pm in the gym for the Super U! Challenge school assembly. This is an interactive show based around positive behavior, character building traits and promotes respecting others. We are so excited and hope you can be come! Tonight from 4:30-7:00 we will receive 20% of all inside sales at the Hillsdale McDonald's. We can't wait to see everyone there. November 16th Student Council will be holding a formal dance in the HPS gym starting at 6 pm and ending at 8. There will be refreshments and music. Tickets will be $2 dollars per student and $3 for adults, the ticket forms will be sent home with students and you can find extras in the office. We hope to see you there. Thanks! Spirit wear order forms are finally here! They are being sent home with students today. Orders are due by Thursday, Nov. 15. Although tomorrow is Halloween, students should still come to school in their uniform, following the school's dress code. Thank you! We have decided to extend the Box Tops Competition until tomorrow. Mrs. Dickey's class is currently in the lead. The winning class will get an extra 15 minutes added on to one recess and get to pick one person to participate in the eat it or wear it challenge. All Box Tops must be turned in by the end of the day tomorrow. Due to transportation delays, we had to cancel today's swimming for the 3rd through 8th graders. Two students will be competing in The Eat It or Wear It Challenge tomorrow morning after opening. Don’t miss it! Reminder: Picture day is tomorrow! Students should wear their uniforms for pictures and bring their completed forms to school with them. HPS will be hosting a Health Heroes flu vaccine clinic on Thursday, October 18th. If you would like your child vaccinated on that day, please fill out the consent form that was sent home. Extra forms are in the office if you need one. Reminder: Thursday's dismissal starts at noon. There will be no lunch and no After School on Thursday. Conferences are from 1-6 pm and should have been scheduled with your child's teacher. There is no school on Friday 10/5. Due to unforeseen circumstances, today's cheerleading clinic has been cancelled. The make up date will be Friday, November 2nd. If your daughter planned to attend, please pick them up at normal dismissal time. Otherwise, they will be released to the after school program and will need to be picked up from there before 5pm. Day 1 of the 2018 Cheer Clinic is tomorrow 9/28 from 3:30-5pm. Girls should bring comfy clothes and sneakers to change into for the clinic. All girls should be picked up from the Gym at 5pm. Parents, please see Mrs. Fowler when you pick your daughter up to let her know your child's shirt size and short size. We can't wait to see all of the girls who signed up this year! This Thursday, Sept. 27 someone from the Health Department will be at HPS doing hearing and vision screening. Every child will be screened unless a written letter is submitted to the office by the parent. Sorry for any inconvenience, but these are the rules from the Health Department. If you do not want your child screened please send a written letter by Thursday Morning. The 6th grade parent teacher conference sign up forms are being sent home today. Please complete the form and return it to school as soon as possible. Thanks so much! 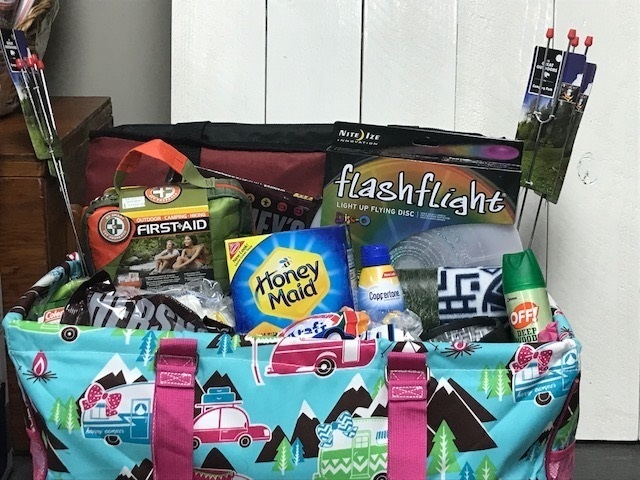 Our first box tops submission is coming up fast! Don't forget to clip those box tops and bring them in to your teacher. The class that collects the most box tops will get 15 minutes added on to one recess. They will also get to pick one lucky classmate to participate in the eat it or wear it challenge against Mrs. Fowler. There were a few mistakes on the cheerleading clinic sign up form that was sent home yesterday. A corrected version will be sent home today. If you have already returned the form to sign your child up there is no need to redo that. Please just make note of the changes in dates and times. Our morning program is looking for donations. Any board games, puzzles or craft items that you are willing to part with would be appreciated. 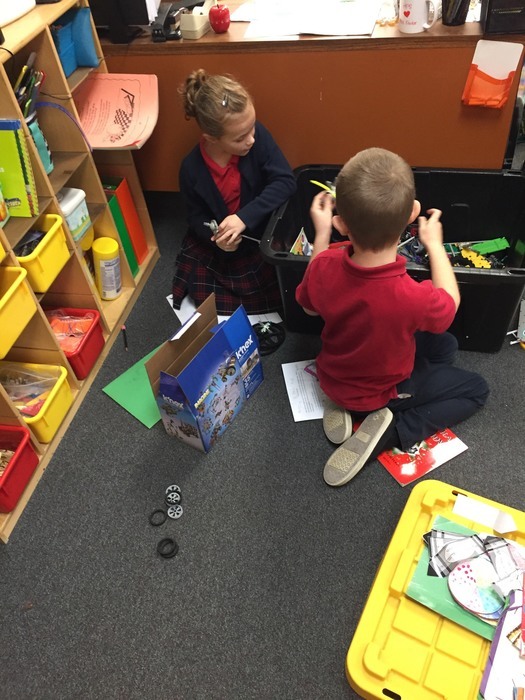 You may label items with "MORNING PROGRAM" and drop them off in the office. The Patriot 5K is this Saturday at 8am. Don’t forget to sign up to run/walk. T-shirts are going fast and cannot be guaranteed for those who register on race day. Get your spot saved now! This is a great event that directly benefits HPS students, thanks to our amazing Parent Council. Reminder: PE days are on Mondays and Wednesdays. Students 3rd-8th grades change into a gray shirt and blue shorts for PE and K-2 wear tennis shoes. Please do your best to ensure that your child brings what they need for PE to school on those days. If your family needs assistance in obtaining any of the needed items please contact the office. Alpha Signs did an amazing job with our new sign. They brought a special HPS helper when they came to hang it. Thanks Connor for doing an awesome job! This message is for 5-8 girls interested in volleyball. Mrs. Dickey will be holding a parent meeting Monday, August 27 at 3:45 in the gym. If your daughter wants to be on the team please attend the meeting. She will pass out practice and game schedules at that time. You must have a sports physical on file in order to participate in the first practice. We are so excited to see you all tomorrow for the first day of the 2018-19 school year!! A quick note: There will be no milk for purchase and no subway/pizza day during the first week. Sales of those lunch items will begin the week of 8/27. 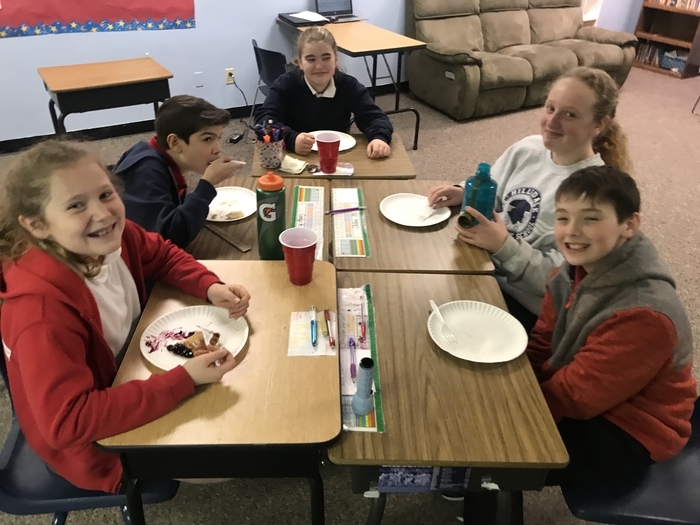 Visit Hillsdale Preparatory School’s Facebook page to see round 2 of the Eat It or Wear It Challenge. Follow our page, share the video, then comment with suggestions of foods to use in Round 3. You’ll be excited to see who Mrs. Fowler is going up against next! Reminders/Updates: -Today is the last day for summer tutoring. Thanks to everyone who participated and made it a great success! -The driveway and parking lot will be seal coated on Monday, August 13th and Tuesday, August 14th. The office will be open, but PLEASE PARK IN THE GRASS. -The clothes closet is open if you are in need of uniform items. -Open House is August 20th at 6:30pm -First Day of School is August 22nd! Mr. Bob and Mrs. Fowler are going LIVE on Facebook tomorrow at 1pm to do the Eat It or Wear It Challenge. Tune into Hillsdale Preparatory School's page to check it out. 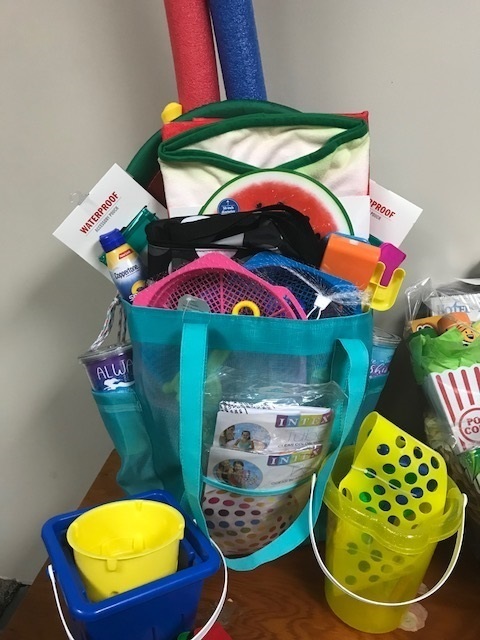 Reminder that all Summer in the City donations are due to the office by tomorrow at 2pm. Please wrap baked goods individually. HPS' booth will be C16, located at the corner of Bacon and Howell Streets. Parent Council's July meeting will be held Monday, 7/30 at 5pm. Hope to see everyone there! 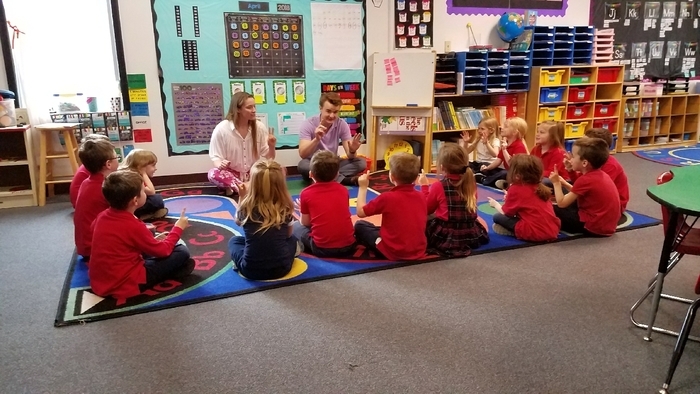 Summer News and Updates: Open House : August 20 at 6:30 First Day of School - August 22 You can find the full calendar on our website Classroom assignments and school supply lists will be sent out at the beginning of August. This school year you will be able to drop your children off as early as 6:15! More information will be sent out about this soon. HPS! 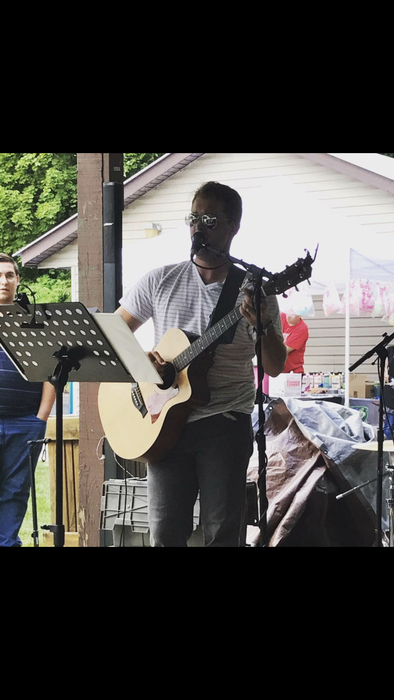 Show your support for HPS and Mr. Blanchard tomorrow morning at Hillsdale Brewing Company for the first ever Kids Show! Mr. Blanchard has put together an entire live show just for kids for the event starting at 10 A.M. There will be a breakfast buffet ($5 for kids, $8 for adults) and plenty of space to dance and sing until 1 o’clock. Come and wear your Patriot gear for this awesome event! See you there! The car wash scheduled for 7/21 has been cancelled. It will be rescheduled for a later date. HPS will be holding a car wash on July 21st from 10-2. We are looking for STUDENTS and PARENTS to volunteer to help wash cars to raise money for the school. Call the office to sign up to help! Today was the first day of Reading Camp and it was a blast! There was some confusion on the time that camp ends and we wanted to clear that up. 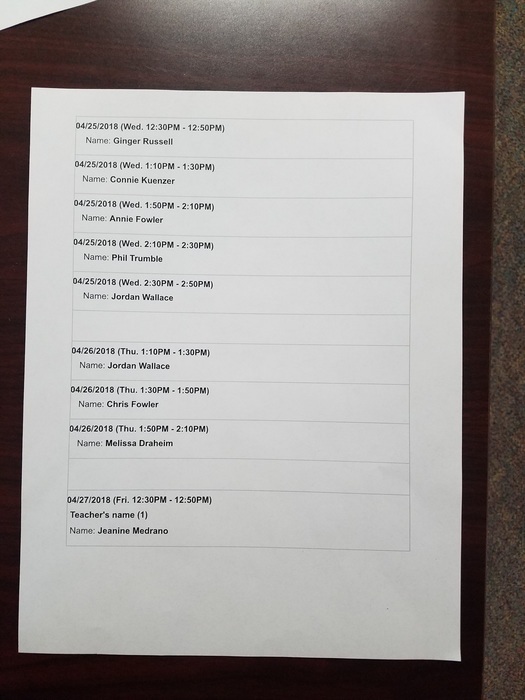 The original paperwork said 12:30, but that has been changed to 12:00. We can't wait to see everyone tomorrow from 9:00-12:00 for another great day! There will be a Parent Council meeting tonight at 6:15 in the art room. Hope you can attend! 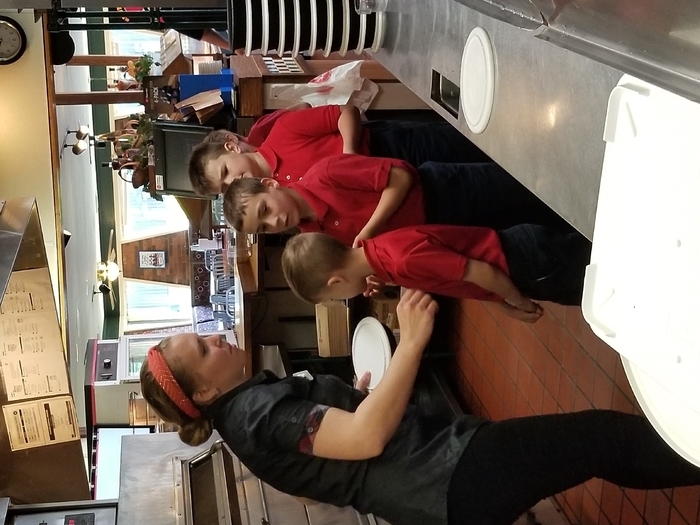 More pictures from Pizza Hut. 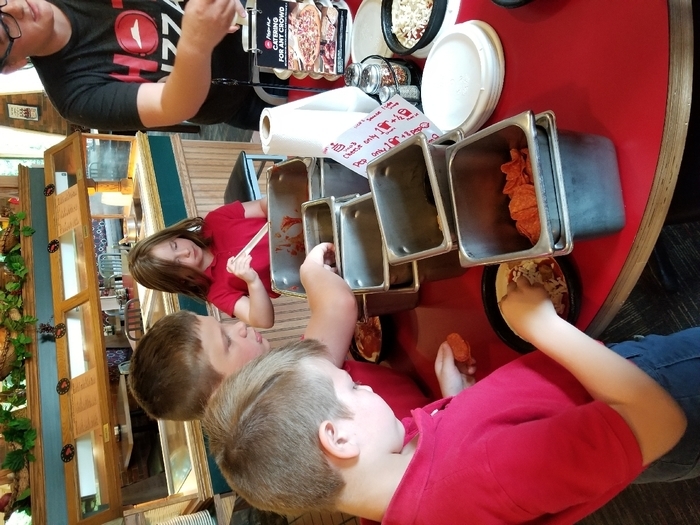 3rd grade had a great time at pizza hut! Can you believe tomorrow is our last day?! Here is a schedule of events: The students should be dropped off at regular time. The awards ceremony begins in the gym at 11. After the ceremony the students will be dismissed from school. Following the ceremony Parent Council is having an end of year BBQ in the gym that is totally free of charge. Everyone is welcome to come eat, play games and celebrate the ending of another great school year. 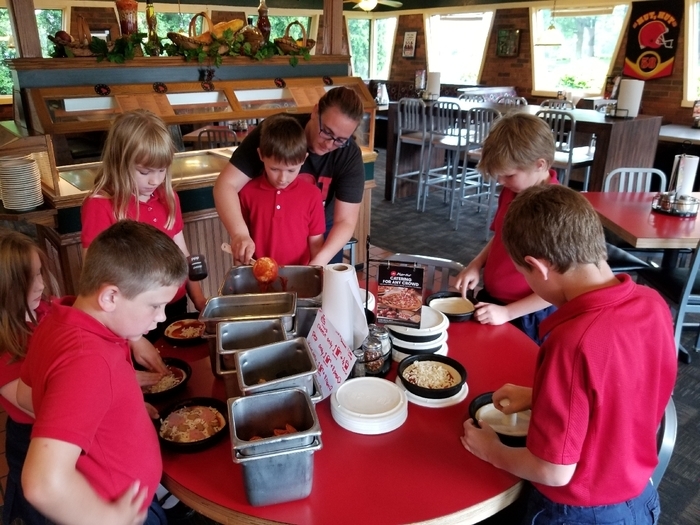 3rd grade goes to Pizza Hut today to make their own pizza. Thank you parent council for financially supporting this. 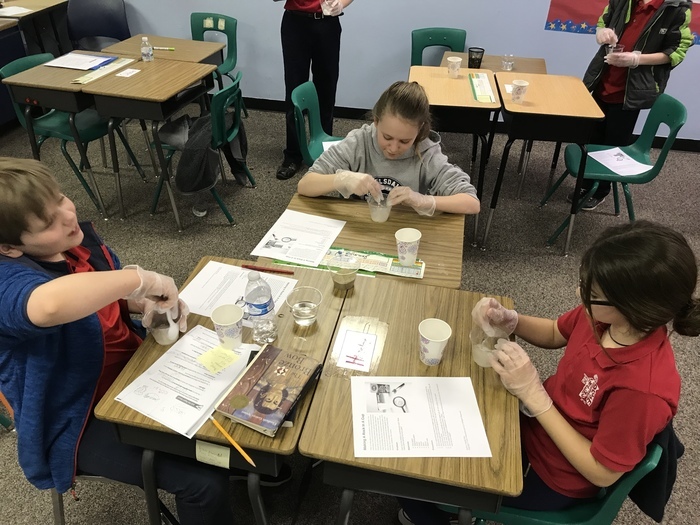 The students receive a great hands-on economic lesson. They will also tour the facility. Reminder: 8th-grade graduation is Tuesday, June 5th at 6:30 P.M. Please have your child here at 6:00 P.M. We will gather in the Art room. 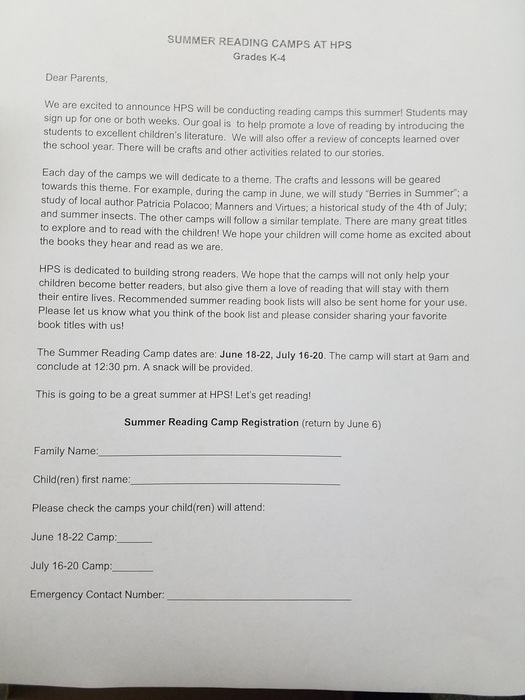 Don't forget to sign up for the reading camp this summer! Stop in the office if you need another form. Reminder: tomorrow is the 6th & 7th-grade field trip to Greenfield Village. We will be leaving HPS at 7:30. Please drop off your student at the front door to the 6th & 7th grade classrooms. Students can wear a red polo or spirit wear shirt. They may also wear shorts or capris. However, shorts must be school appropriate. It is supposed to be in the 80s with a chance of rain. Please pack a sack lunch. Students may bring cell phones to take pictures. Students are responsible for their own cell phones. No other electronics are allowed. Don't forget to use your Small Town Sweet Boutique Coupon before June 2. 20% of your purchase will go to our music program if you present the coupon at the time of check out. Next Wednesday, June 6 is the last day of school. Students need to be dropped off at the normal time in the morning. At 11 we will have an awards ceremony in the gym. Everyone is welcome to attend the ceremony. After the awards ceremony students will be dismissed from school. Families are then welcome to join us in the gym for an end of year BBQ. We can't wait to see everyone there. 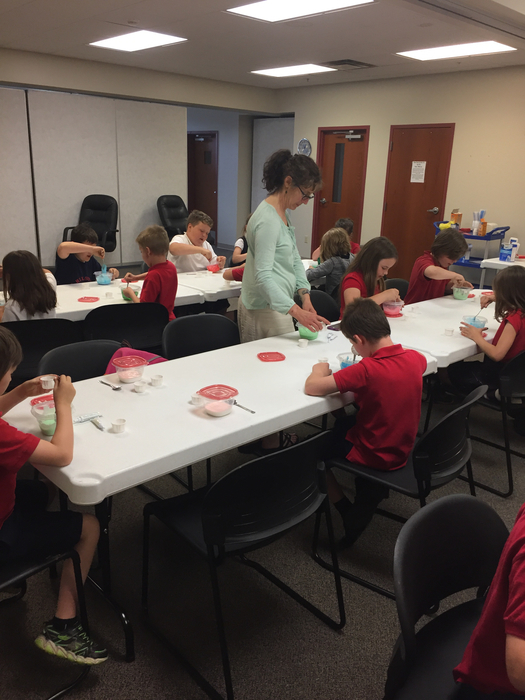 2nd and 3rd graders had a great time making slime at Hillsdale Community Library. The children’s librarian, Ms. Vickie, is the best! 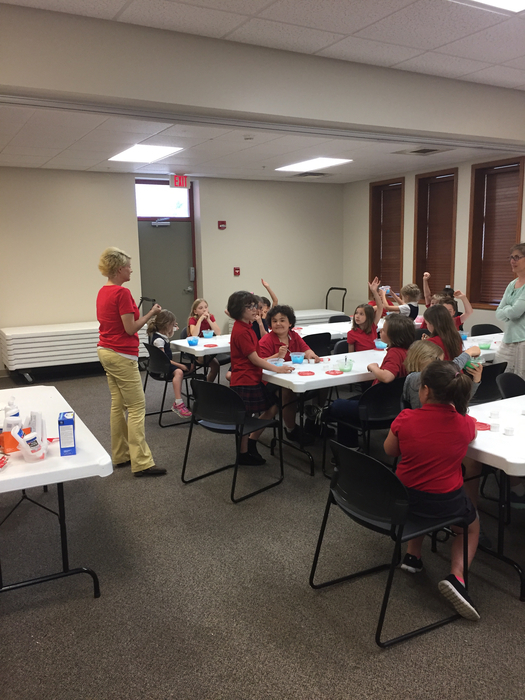 Sign up for Summer Reading and see how much fun she makes the public library. Reminder that the donation forms and money for the Patriots 5K are due this Friday, June 1st. Kids are encouraged to get as much as possible. All proceeds go for different activities for the kids. If $50 or more are collected they can be in a drawing of a hover board. The more money collected the more prizes the students earn. Prizes will be given next Wednesday! Thanks, PC. 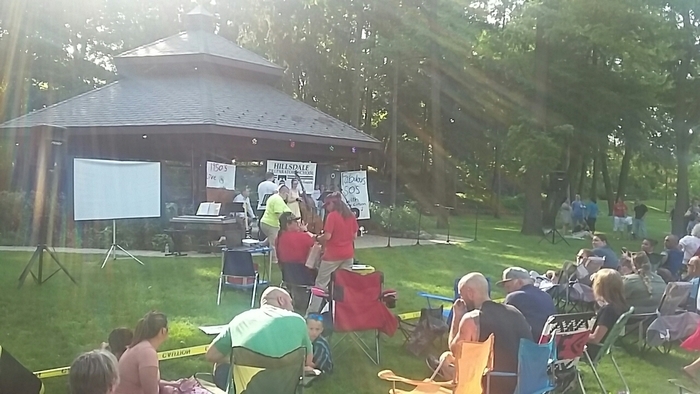 The concert is starting and there's still time to get to Mrs. Stock's Park. Parents! 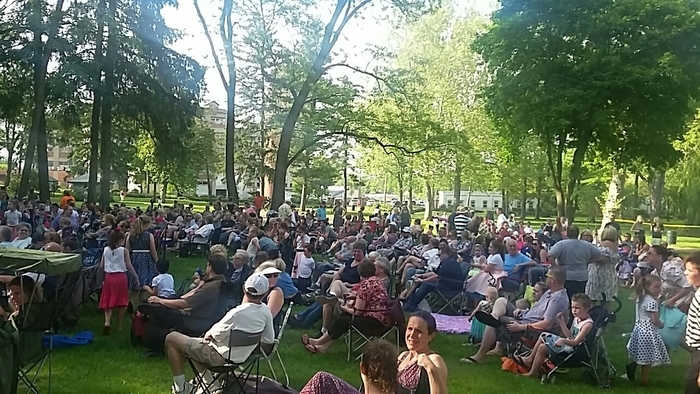 A few reminders for "The Fabulous 50's" concert in Mrs. Stock's Park Tonight. - 5:15 p.m. is the time to shoot for warm up times. Start time is 6 p.m. - Parking is across the street at the mill. - Outfits for the concert are strongly encouraged! - Boy's ideas: White shirts, blue jeans, sun glasses - Girl's ideas: poodle skirt, polka dots, small scarf/ sash - Like last year: Bring your own chair or blanket to sit on, snacks, friends, family, cameras. Good News....spirit wear orders are here! If you placed an order it will be sent home today. Double Good News....free t-shirts are being passed out today! Students who turned the re-enrollment form in on time and are coming back to HPS get a free t-shirt. Those will also be sent home with students today. 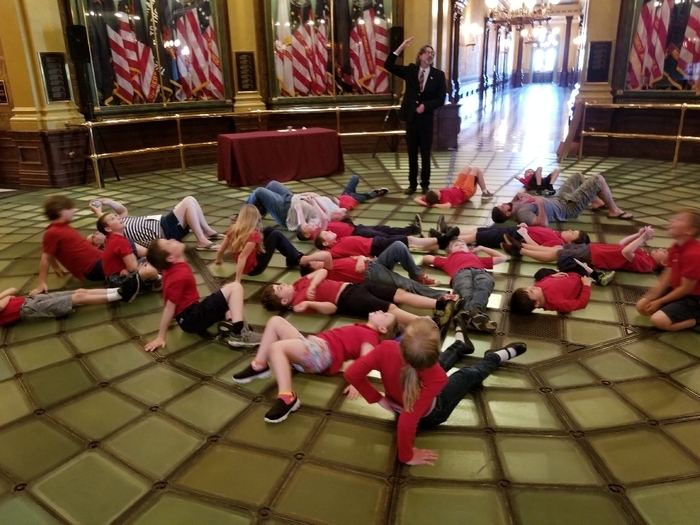 Great day in Lansing yesterday at the State Capitol and Michigan Hisorical Museum for third graders! 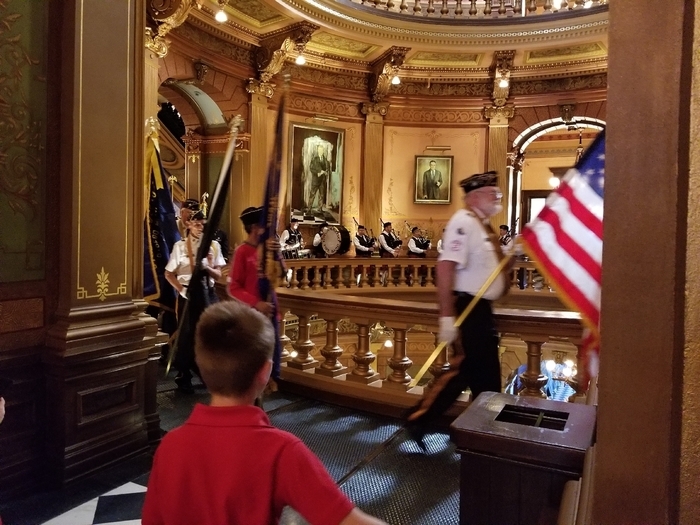 We were able to see 100 veterans in a colorguard parade as bagpipes played, met our representative Eric Leutheuser, watch the representatives vote, and much more. 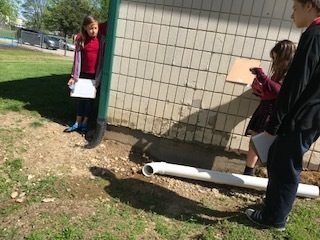 The 6th grade students went outside to find real life examples of erosion. 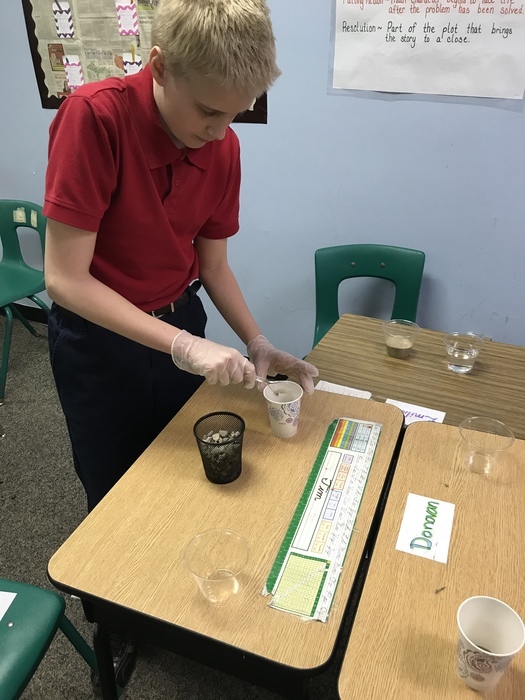 They took a picture of the erosion they found, made observations, and thought of ways to stop or slow down the erosion. Parents! A few reminders for "The Fabulous 50's" concert in Mrs. Stock's Park on May 29th. - 5:15 p.m. is the time to shoot for warm up times. Start time is 6 p.m. - Parking is across the street at the mill. - Outfits for the concert are strongly encouraged! - Boy's ideas: White shirts, blue jeans, sun glasses - Girl's ideas: poodle skirt, polka dots, small scarf/ sash - Like last year: Bring your own chair or blanket to sit on, snacks, friends, family, cameras. - We are anticipating good weather for Tuesday, BUT if for some reason we are forced to cancel, Wednesday, May 30th will be our rescheduling date. 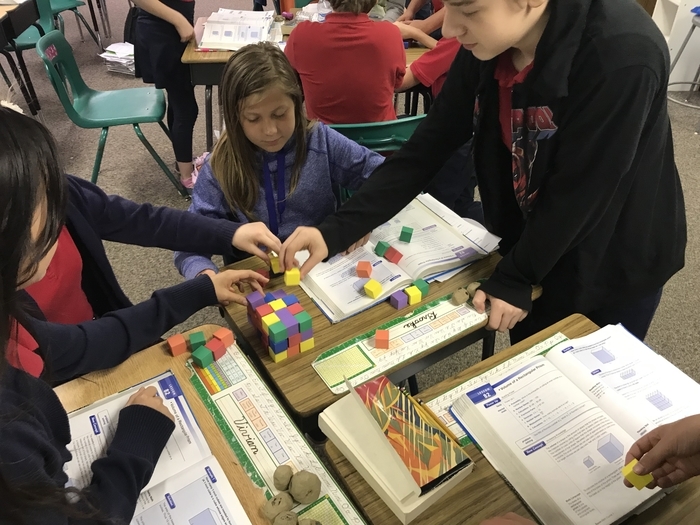 The 6th grade math class explored volume today, by creating their own rectangular prism and sloving for the volume. If your child is in the 6th grade reading class, their Giver projects are due tomorrow. 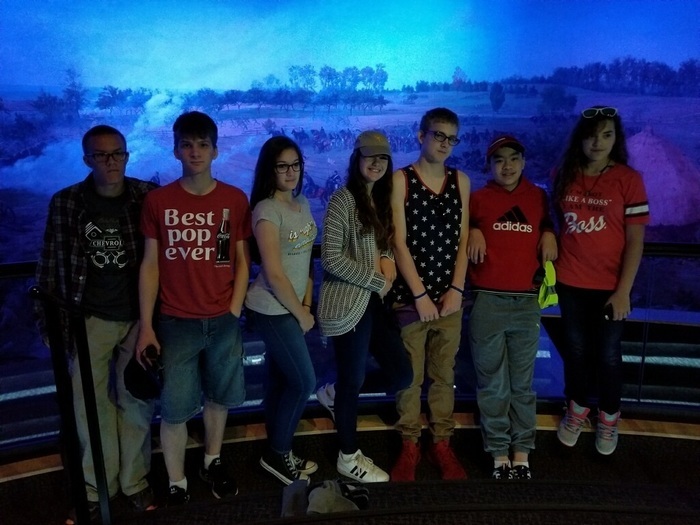 The 8th Graders are having a great time on their trip to Gettysburg/D.C. 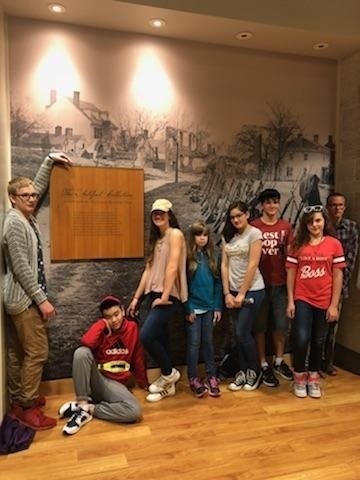 They started their first full day with a trip to the Gettysburg Museum. If your child is in the 6th or 7th grade, permission slips for the upcoming field trip must be turned in by tomorrow. Thank you in advance for getting those slips in by tomorrow. It's re-enrollment time! We've recently sent out the re-enrollment form for next year. We really want to see your child(ren) back with us at HPS! Would you kindly take a moment to fill out the form and see that Melody gets it? If you need a form, give us a call. 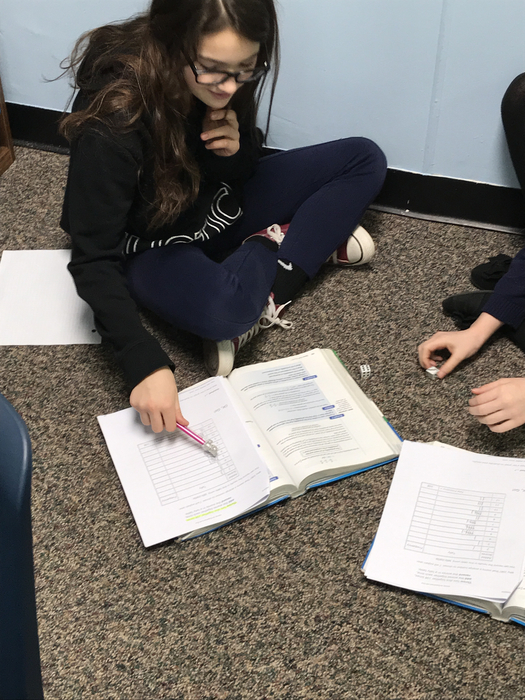 In order for us to plan staffing and classroom assignments we need to hear from you....Enrollment looks great for next year and some grades are getting full. Please don't delay! As a special bonus, every child re-enrolled by Friday, May 25 will be given an AWESOME new HPS T-Shirt , for free. What a Deal! Thank you SO much for your continued support. Just a reminder parents, tomorrow we will be serving coffee, tea, hot chocolate and donuts. If you bring your own thermos we will fill it up for you. We just want to say thanks for the hard work you do as parents! Thank you!!!!!! Spirit Wear orders are due today! If you would like to place an order please have it turned in by the end of the day. 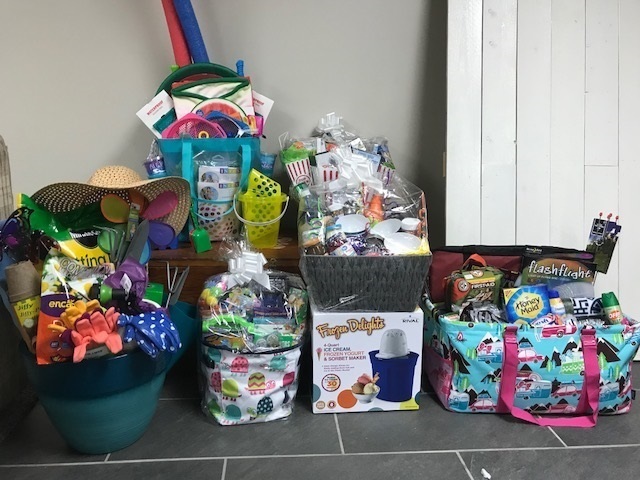 More baskets for the Cash Raffle. 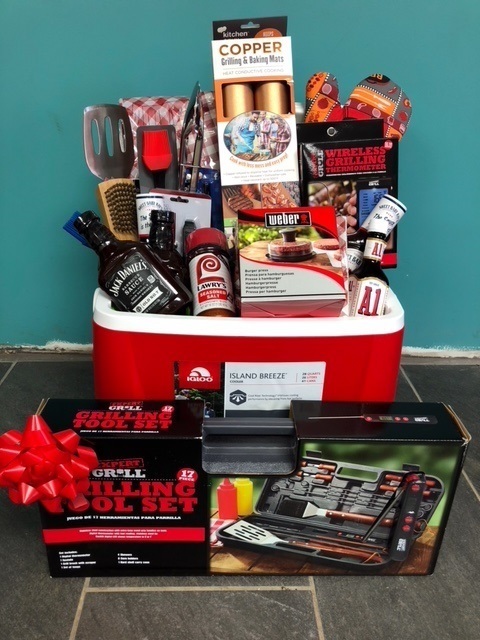 Baskets that will be auctioned off at the Cash Raffle. 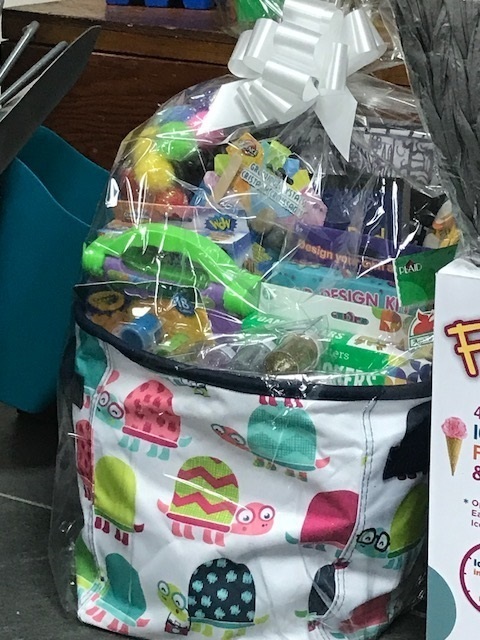 Thank you for all of your donations for the classroom baskets! 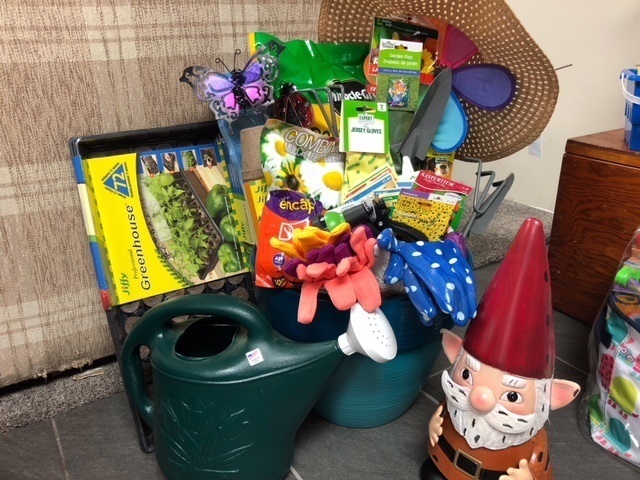 We can't wait to auction them on Saturday at the Cash Raffle. We still have tickets available they are $35.00. Stop in the office or see a Parent Council member to purchase yours before they are gone. We will post pictures of the baskets on the website and on Facebook. 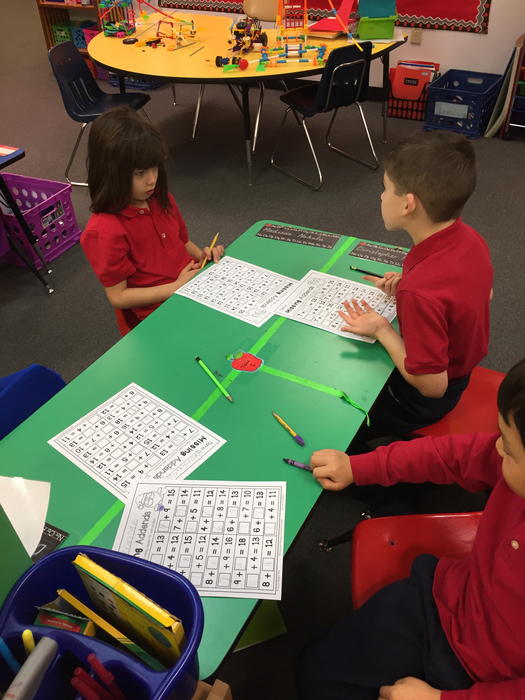 Kindergarteners love Latin time at HPS! 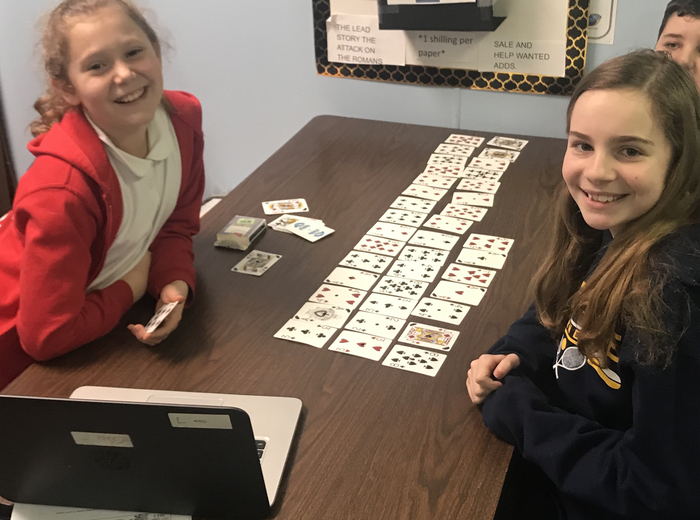 They have been working hard at mastering the numbers in Latin! Here's a glimpse of them learning and being quizzed!! The 6th grade class will be attending the book fair tomorrow and Thursday. Just a reminder that all 6th grade Rosa Parks reading projects are due tomorrow. There will not be a Board Meeting this evening. The next meeting will be Monday, May 21 at 5:00. 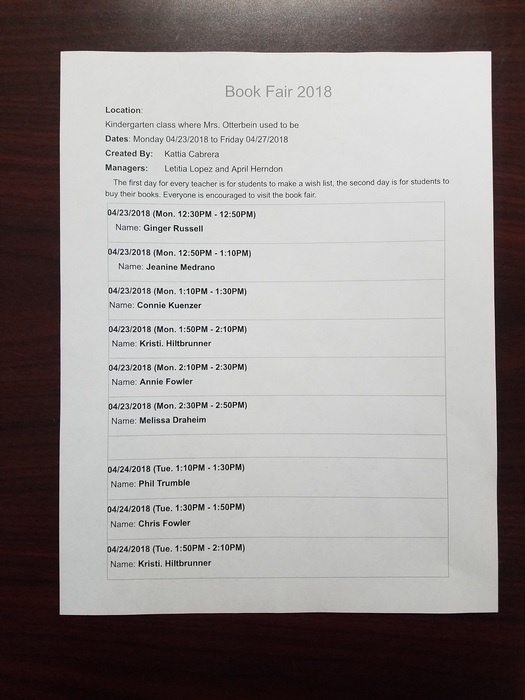 Here is a copy of the Book Fair Schedule. Each classroom will visit twice. Their first trip they will make a wish and their second trip they can purchase books. 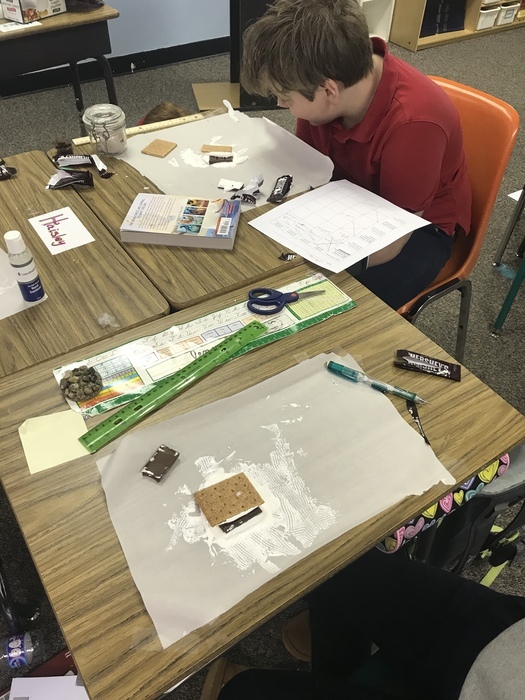 The 6th grade reading class has started a project! Students will have today and tomorrow to work on their projects in class. Projects are due on Tuesday, April 24th. 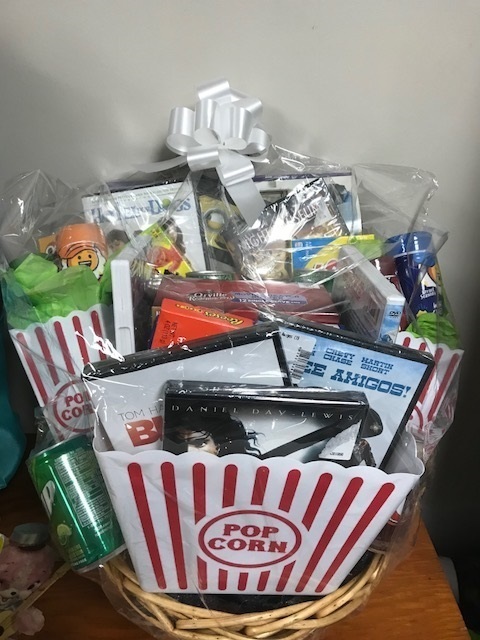 Reminder- items for classroom baskets for the Parent Council raffle dinner are due tomorrow. Please see the flier that was sent home with your child for more information. We can't wait to see everyone at the Open House tonight from 5:30-7:30. Bring your friends, family and neighbors. Every classroom will be open and there will be goodies in the gym. See you there! Spring Fling Dance sponsored by Student Council is tonight from 6:00 pm-8:00 pm. Tickets can be purchased at the door. Refreshments provided: Cupcakes, Jello, and Lemonade Hope to see you there! Greetings from the the TOP RATED SCHOOL in Hillsdale County! 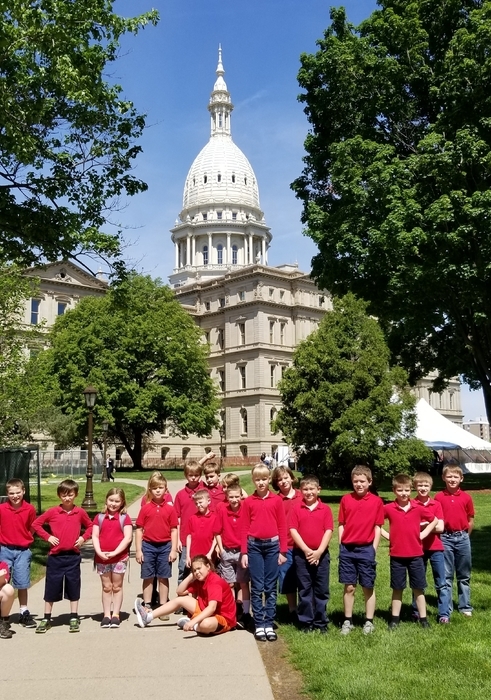 The Michigan Department of Education released its new rating system and HPS is number 1 in Hillsdale County. Our composite score is 89.74, out of 100. This rating takes into account, among other variables, STUDENT ACHIEVEMENT, access to the arts, music and STUDENT ACADEMIC GROWTH. I want to thank all of you who make HPS home for your precious children. It is our humble responsibility to teach, to mentor, to nurture and to love all of our students and their families. We are called THE FAMILY SCHOOL for a reason. The rating system is validation for us that our approach works! Students LEARN here and they are treated with respect and dignity. COME HELP US CELEBRATE. Tuesday, April 19, from 5:30 - 7:30 we are hosting a TOP RATED SCHOOL celebration here at HPS. All the staff will be here to demonstrate classroom activities that are WORKING! Students will be playing music and singing, and there will be special GIFTS for everyone!! Again, thank you to this entire community for the support you offer this wonderful school! PLEASE accept my most heart-felt gratitude,and PLEASE come next Tuesday and help us celebrate!! Hillsdale Preparatory School -- The FAMILY SCHOOL -- Number 1!! Tomorrow is the last day to purchase tickets and corsages for the Spring Fling. The Dance is on April 13 from 6:00 - 8:00 in the gym. Tickets are $3.00 a person. 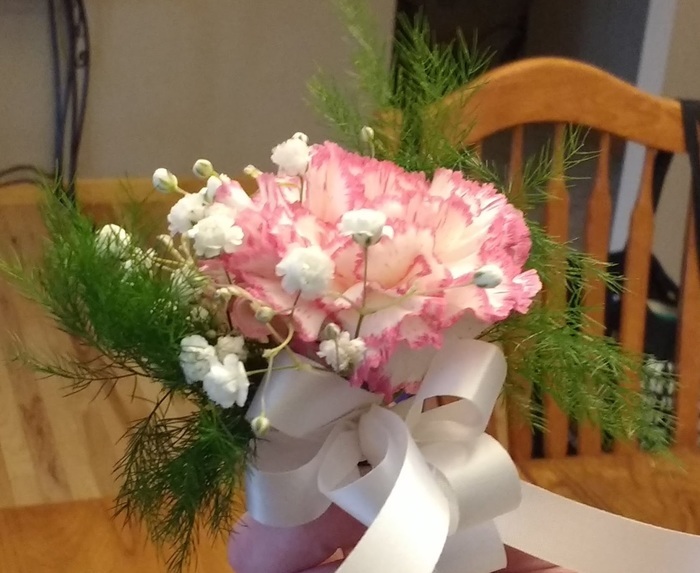 A wrist corsage is $5.00 and a pin on corsage is $3.00. Please turn your form and money into the office by the end of the day tomorrow. There are extra forms in the office if you need one. Mrs. Medrano is in search of guest readers to come read to groups of students from 9:40 to 10:30 on Mondays and Wednesdays. If you are interested in being a guest reader please contact Mrs. Medrano at jeanine.medrano@hillsdaleprep.org. 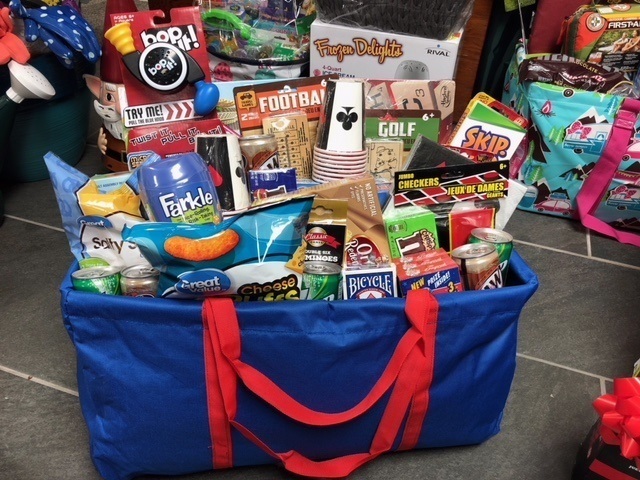 Parent Council is collecting donations for classroom baskets to be raffled at their upcoming dinner. Fliers will come home today with more information. Students can earn an extra casual day and a drawing into a raffle for reading Runaway Ralph on their own and submitting a book report to Mrs Fowler by April 20th. Your child’s teacher has the book report forms. Happy Spring Break! Third quarter report cards are going home with students today at dismissal beginning 11:45. Tomorrow during the movie the concession stand will be open. We will be selling Gatorade, water, popcorn, glazed doughnuts and candy. Everything will be for sale for $1.00. Tomorrow is also a half day of school. There will be no lunch or after school. Please make arrangements to have your child picked up at 12:00. Student Council is having a dance! On April 13th Student Council will have a formal dance from 6-8 pm. Tickets will be $3 a person and corsages will also be sold and handed out at the dance. There will be refreshments and music along with crafts for the younger kids. Tickets for the dance and a form for the corsages will be passed out Thursday. Student Council is hosting a "Spring Fling" dance on Friday, April 13th from 6 pm - 8 pm. Tickets are $3.00 per person (pre-purchase is available). 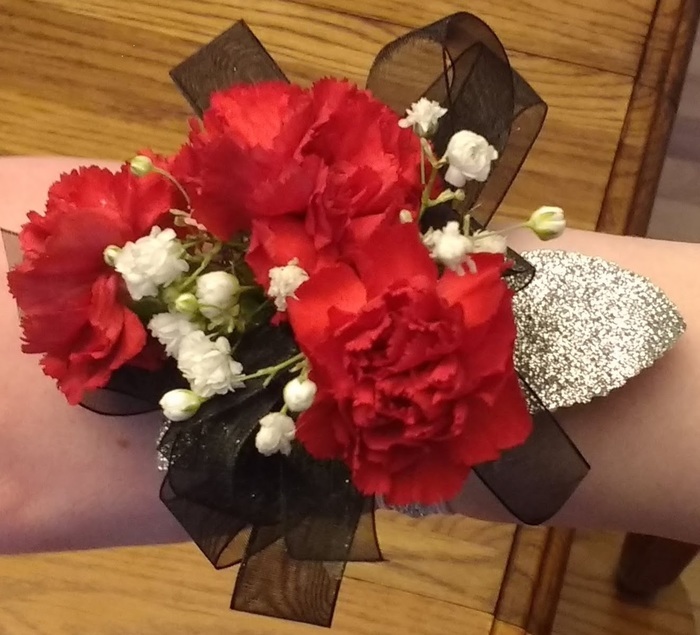 Corsages are available for pre-purchase: Wrist is $5.00 and pin on is $3.00. Forms will be sent home today. 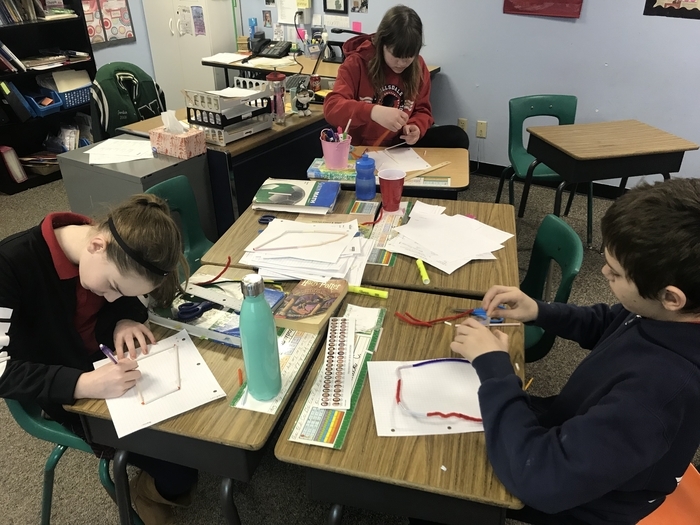 Yesterday, the 6th grade math class was able to create prime factorization with triangles. We also talked about jobs that use prime factorization and real life situations where you can use factoring. The 7th/8th grade team did well in the quiz Bowl competition. They were not only "rookies" in the competition, but they had to compete as an all 8th grade team. We will start preparing for next year on Monday ! Go Patriots! The first session of Quiz Bowl is over with the HPS 5th graders finishing one point shy of 3rd place! The 6th grade team finished 5th, just four points away from 3rd place. Both super jobs for our very first time participating and only having 6 weeks to prepare. Next year will be different! 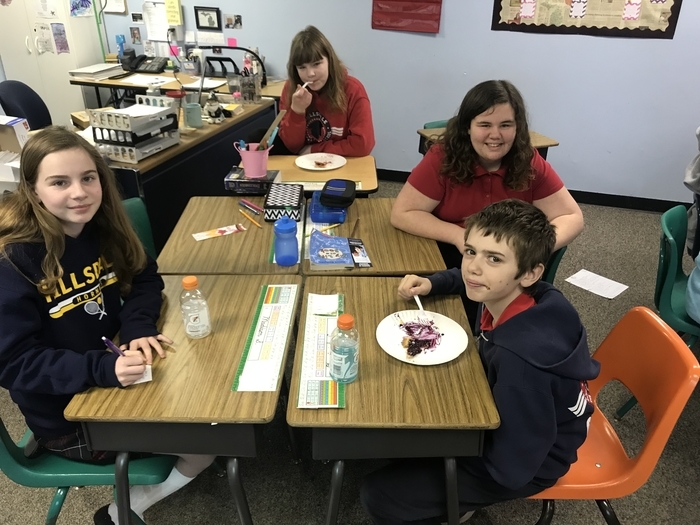 The 7th & 8th Graders are selling Krispy Kreme Doughnuts to raise money for their field trip to Gettysburg and Washington D.C. They will be selling 1 dozen of glazed doughnuts for $9.00. The money is due at the time of the order and the doughnuts will be delivered on Monday, March 26th. There will be a booth set up to order doughnuts at the Science Fair. 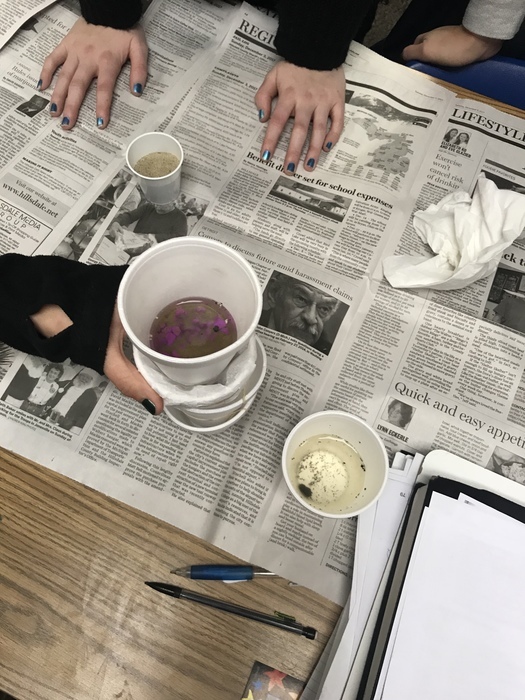 Science Fair Projects due Tuesday 3/20/18 Friends and family are welcome to join in the HPS gym from 3:45 – 5:00 to explore our science fair. Also the student council will have several hands on stations for everyone to enjoy. Please drop your Science Fair project off in the Gym before School on the 20th. Judging will begin around 9:00. Remember you can turn in your project early if you wish, just drop it off in Mr. Trumble's room. It’s not too late to start there are many projects that can be done over the weekend. Have Fun! 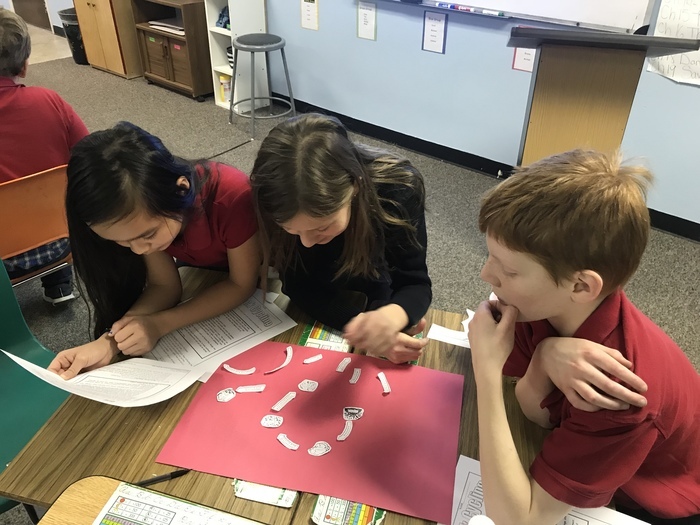 The 6th grade students were able to work together, use their background information, and use a little extra information to piece together the rock cycle. 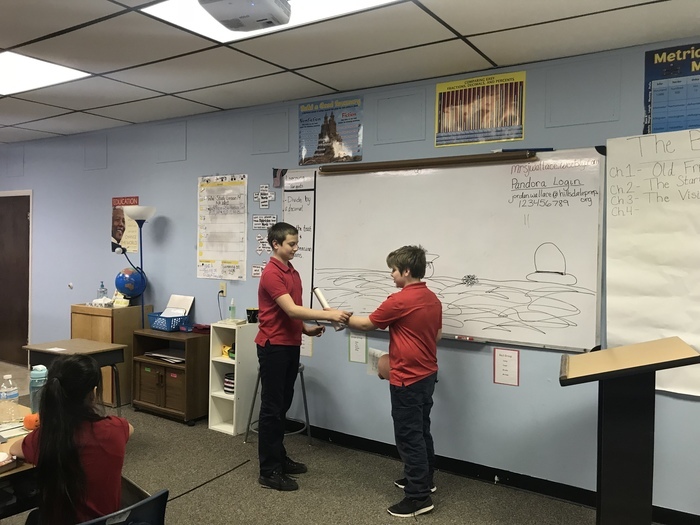 The 6th grade science class created a model to help demonstrate and explain sea floor spreading. St. Patty's Casual Day! This Friday students can dress casual if they donate $1 to the 8th grade D.C. trip fundraiser. Money will be collected in the classrooms and students are reminded that proper behavior is expected just as if they were in uniform. Also, no "distracting or disruptive" attire is permitted. Thank you. 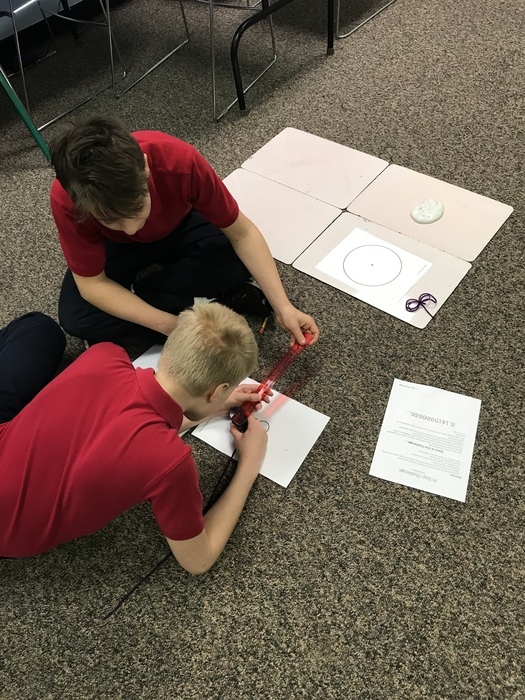 To celebrate pi day, the 6th grade math class had an investigation to see which group could get their circumference and diameter measurement calculations closest to pi. Just to correct the error, the info about the Spring Concert is now posted in our "Live Feed" section of the mobile app and webpage. Hope everyone comes out to see another great music event! Parents of 4-7 grade girls that are interested in volleyball next season. Mr. Blanchard will be having an open gym after school on Friday, March 16 until 4:30. Gym clothes and shoes will be just fine. We will have basics and fun games to get the volleyball buzz going again. If your child usually goes to after school, they can go afterward until 5. 8th graders that have no more eligibility may attend as well. Thanks! Go Patriots! Johnny B. Goode! Parents! 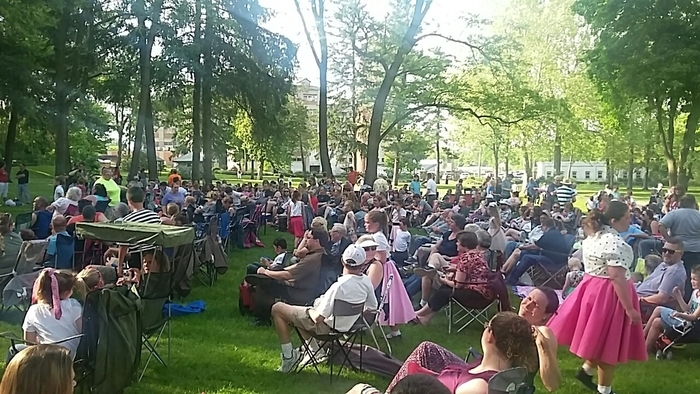 Back by popular demand, our Spring Music Concert will be planned to be held at Mrs. Stocks Park on the evening of Tuesday, May 29th. (The day after Memorial Day, the same as last year) 6 p.m. will be our start time with a call time around 5:15. Make sure to wear your blue suede shoes for this years 50s theme. Student attire: Boy's ideas: Rolled jeans and a white tee shirt, black leather or varsity jackets, plain suit Girl's ideas: polka dots, poodle dresses, tied scarf/ bandana Be creative! Anything 50s to make it fun. Pending bad weather, plan for the following Thursday, May 31st for a makeup date. Thanks! 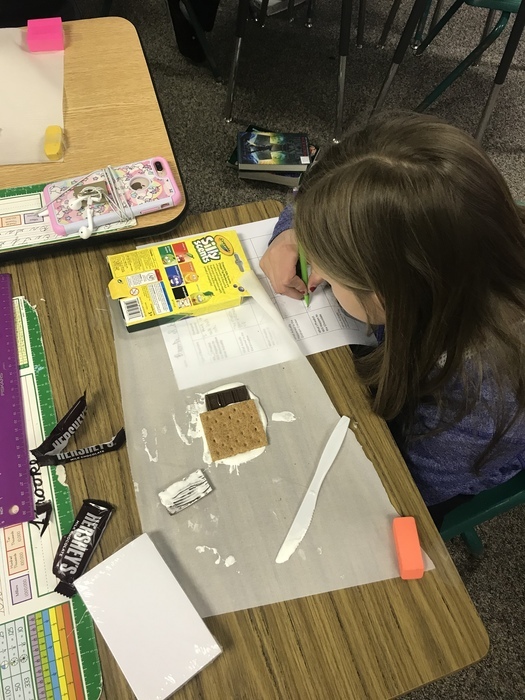 The 6th grade class was able to explore more about plate tectonics with a s’more boundary investigation. The Mouse and the Motorcycle seems to be a big hit. 40 students answered the trivia questions today! I hope you are all enjoying time together as a family reading the book. Keep it up! 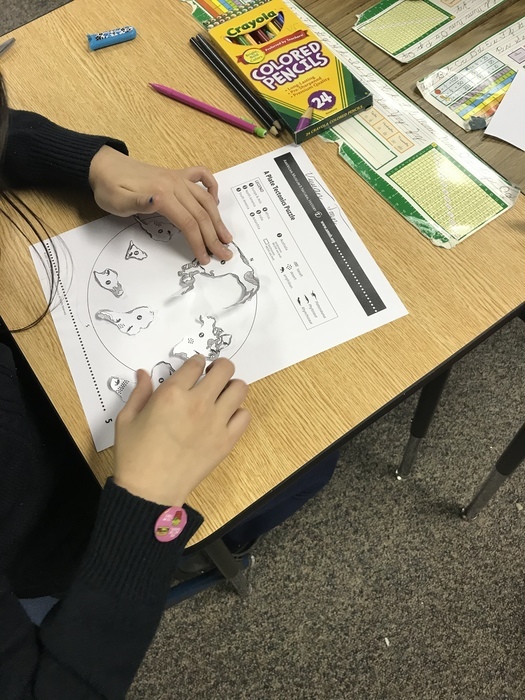 The 6th graders were able to piece together the continents to make one supercontinent. Parents, This summer we made some adjustments to the school uniform requirements. 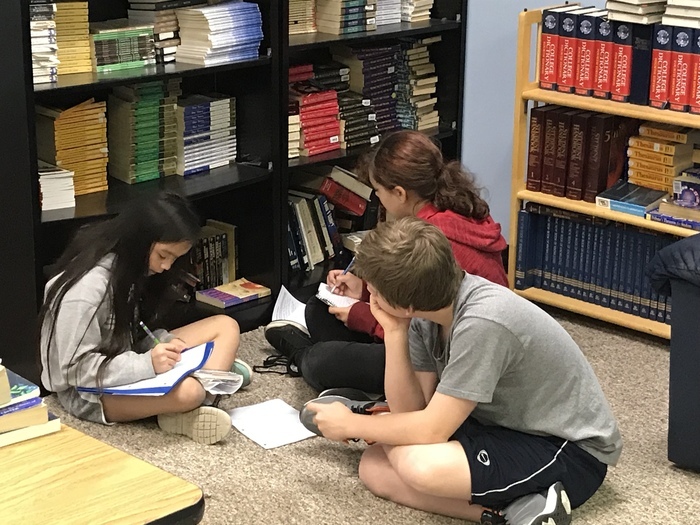 Allowing students to wear athletic shoes was a way to keep the concept of the uniform and help parents who were finding it difficult to buy appropriate dress shoes. It was not intended to allow just any athletic shoe. We have students who are far away from wearing a black or brown athletic shoe. We have neon green and pink shoes and even shoes with flashing lights. Please insist your child adheres to the dress code. Thank you. Congrats to Mrs. Russell's class for winning the Boxtops for Education contest! They will get the ice cream party. As a school we brought in over $500! While very good, we have gotten as much as $1,000 in the past!!! This is a very easy way to earn some money for the school. 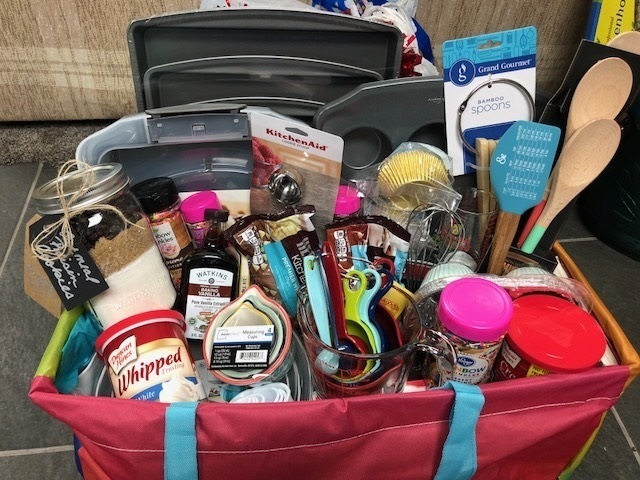 Let's remember to clip those boxtops for next fall's contest! 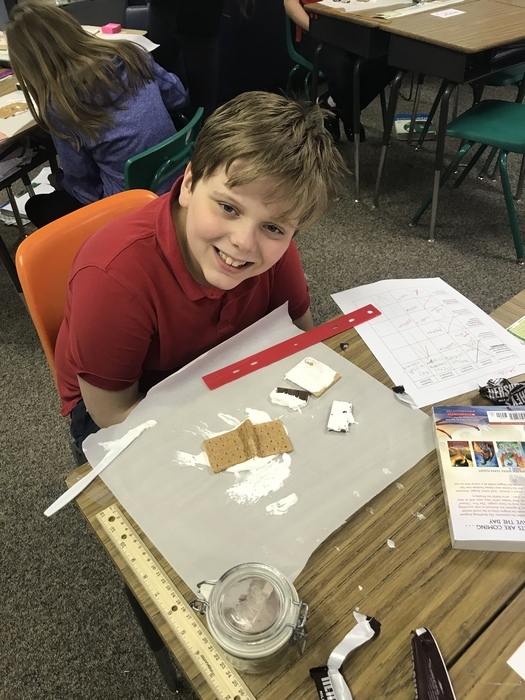 Sixth grade rocks! 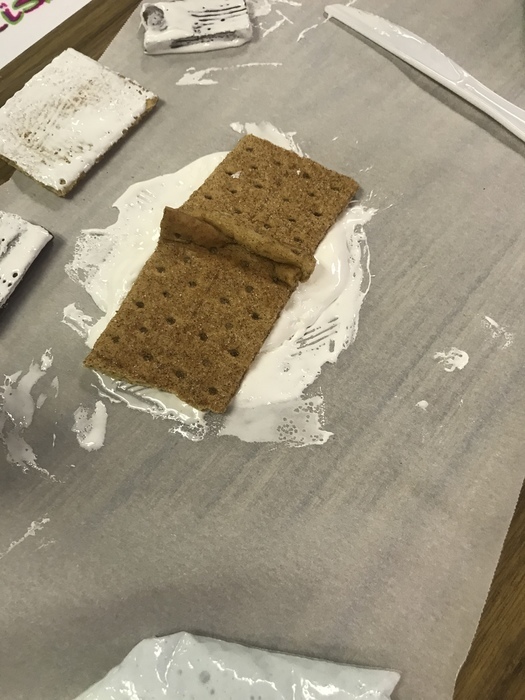 The 6th grade class made sedimentary rocks today. We’ll see how our rocks turn out on Monday. Literacy Night was once again a HUGE success! Thank you to all that came out. Those who attended may dress casually tomorrow. 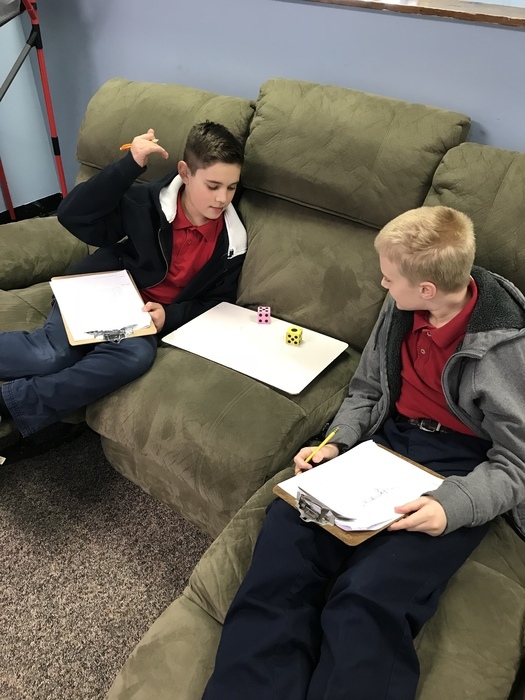 The 6th grade math class had a blast finishing up their probability dice activity today. 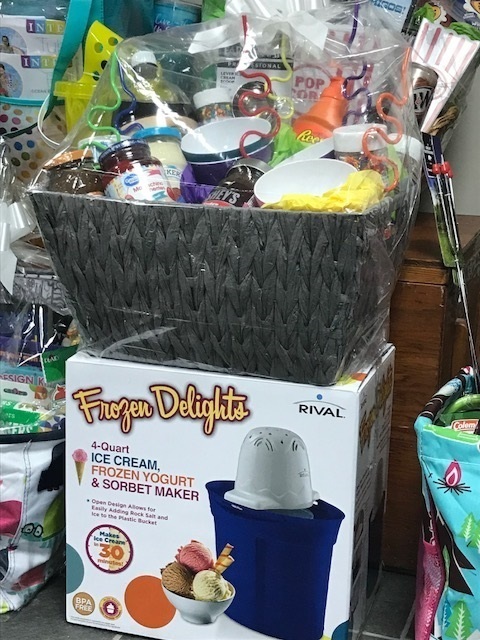 Tomorrow, February 28, is the last chance to get those Box Tops turned in to count for the ice cream party prize. You have until 8:30 tomorrow morning to help your class beat out Mrs. Russell's class. Mrs. Draheim is running a close second with a chance to win the prize. Literacy Night, tonight 6-8pm. Every FAMILY will get a copy of the book The Mouse and The Motorcycle. Don't forget to bring your old books to the book exchange! Hope to see you tonight! The Parent Council is once again having a Cash Raffle for their annual fund raiser to support the school. The drawing will take place on April 28 at the Hillsdale Moose Lodge. There are 15 cash prizes and the grand prize is $1200! Doors open at 5 and a taco and fried chicken bar dinner starts at 6. Tickets can be purchased at the school or from any of the PC members. Only a limited number of tickets will be sold so don't wait! HPS is having the 2nd annual Literacy Night on 2/27 from 6-8pm. There will be activities for all ages, games, prizes and snacks.ALL are welcome! Attendance will earn you an extra casual day on Wed. It's time to turn in those Boxtops for Education again! The class that turns in the most will get an ice cream party paid for by Mr. Bauman! All Boxtop coupons must be turned into your teacher and then Ms. Melody by Tuesday February 27. It would help a lot if all coupons were cut EXACTLY on the dotted lines. Thank you. In an effort to promote more parental involvement we would like to distribute a short survey to parents regarding strategies to support school work at home. It was suggested that perhaps an evening session at the school where teachers could demonstrate to parents some ideas and answer questions would be valuable. To that end, we are in need of suggestions for these sessions. In other words, what would YOU like to have presented at these sessions? Please email or give your suggestions to Mr. Bauman, Mrs. Draheim, or Mrs. Fowler. Thank you. Don't miss out...Order your yearbook today! Go to: geskusphoto.com/yearbooks/Hillsdale Preparatory School and order yours for only $8.00 Offer Ends: Mar 2, 2018 If, for any reason, you are unable to order online, order forms are available in the office. I will not be doing Conferences today with schoolbeing closed. I will contact those needing to be reseduled on Tueday. The Snowball Dance is back on! February 23, Friday, from 6 to 8:00 in the gym. Come join the fun and "cut a rug"! Tomorrow's dismissal will be at 12:00 as we will not be doing lunch. Have a great four day weekend (again)! Our pest control company will be treating ants on Thursday, Feb. 15 at around 2:00 PM. Please look at the news section of our website for additional information about our integrated pest management approach. Wednesday, February 14th(tomorrow) is a pay to wear casual clothes day sponsored by Student Council. Pay $1.00 and wear your casual clothes. HPS will open two hours late tomorrow, February 12. Opening assembly will begin at 10:15. Exercise caution and allow extra drive time as County roads are slick and many are still deep with snow. Hillsdale Preparatory School will be closed Friday, February 9. Please take care and don't travel if you don't have to. Come back safe on Monday. Due to the certainty of heavy snow, tomorrow's dance will be rescheduled for a later date TBD. If you brought perishable food items to the school they should be picked up today or taken home by students. This Friday's Snowball Dance will still be held even if school has to be cancelled due to bad weather. The Show must go on! See you there! Just a reminder, tickets for the Snowball Dance are still $3. Starting Thursday the price goes up to $4 for the Dance. Get your tickets early and save a dollar. Everyone should want to save a Buck! We still have 5 sheets of McDonald's coupons left to sell. The sheets have over $29 worth of coupons and cost just $5. If you just use the "BOGO" sandwich coupon you will all but pay for the entire sheet! They you can get a coffee or dessert for that special someone on the 14th! Check out the Student Council article in the "News" section on our website! Candy Gram info is in the article as well! 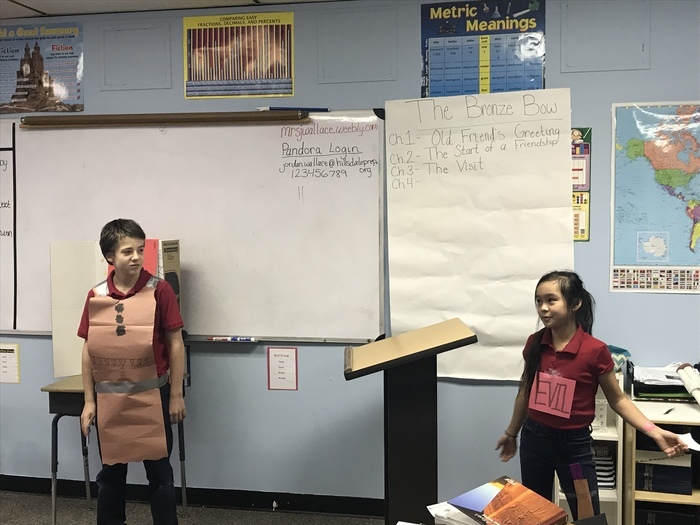 The results are in from today’s Career Day in celebration of Spirit Week: We have 2 first place winners Madison from 5th grade and Zoe from 3th grade. Elizabeth from 8th grade is our runner. 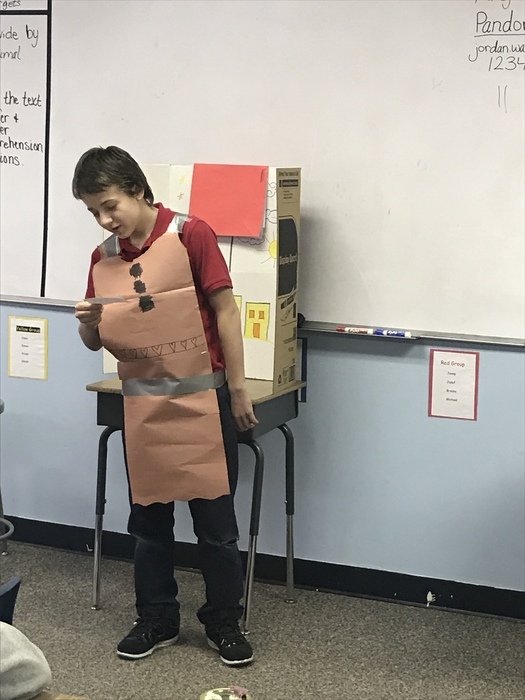 Mrs. Kuenzer’s class won spirit week with a total of 180 points. 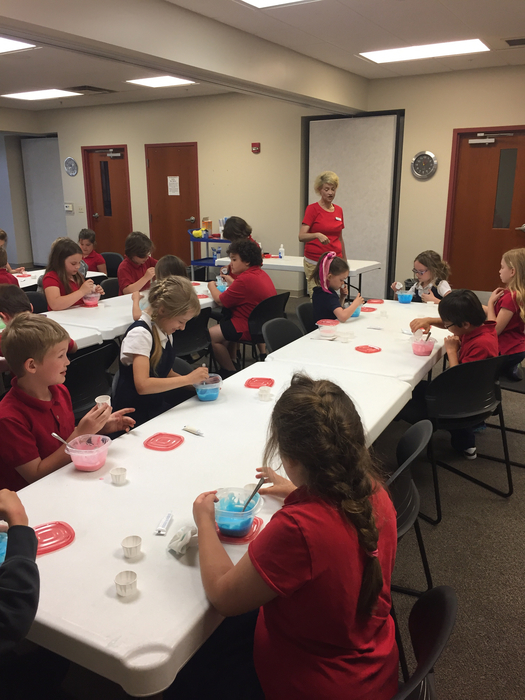 Mr. Fowler’s class, Mr. Trumble’s class, & Mrs. Russell’s class tied for 2nd place with 165 points. Student Council would like to thank everyone for their participation in Spirit Week which was a huge success. We look forward to Spirit Week next year. 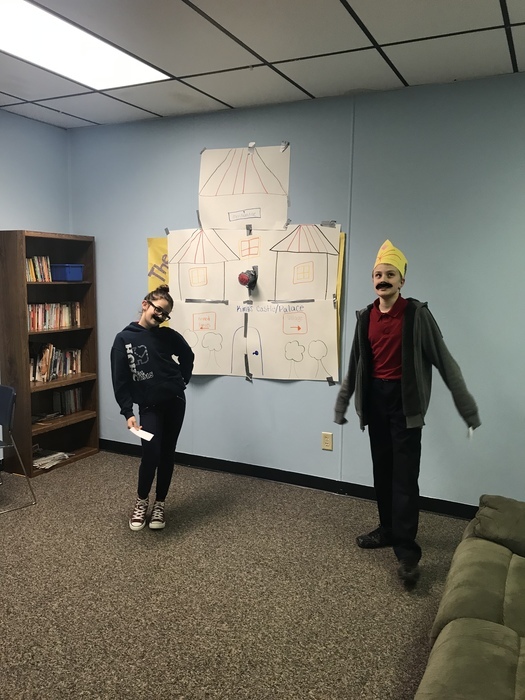 The results are in from yesterday’s Career Day in celebration of Spirit Week: We have 2 first place winners Haisley from 6th grade and Toby from 8th grade. JoJo from 1st grade is our runner. 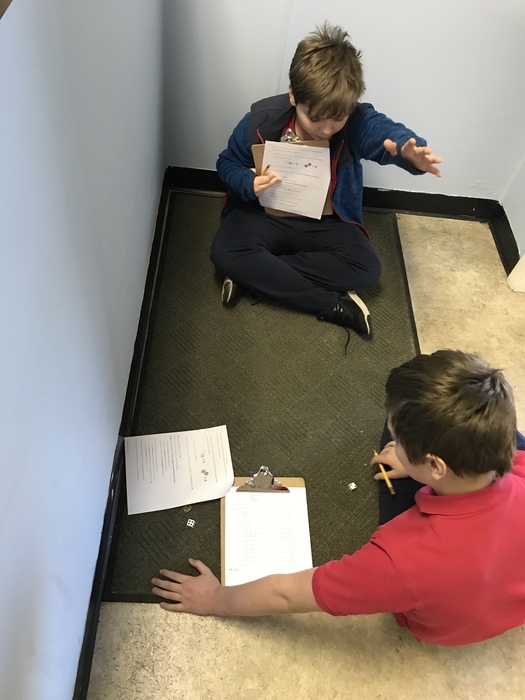 Mr. Fowler’s class is currently in 1st place with 140 points followed by a tie for 2nd place between Mrs. Hiltbrunner’s class and Mrs. Kuenzer’s class with 135 points. CORRECTION! Tomorrow's Parent Council meeting begins at 6:15. There is a meeting of the HPS Parent Council tomorrow, Thursday, at 6:30. The meeting agenda is posted on the website under Parent Council Minutes. 7th & 8th Graders are selling Goat Milk Soap to raise money for their trip to Gettysburg & Washington D.C. Please support our students and purchase some soap. Thank you! The 6th graders looked extra crazy with their wild and crazy hair today! Field trip permission slips for 6th, 7th, and 8th grade are being sent home today. Please have these forms completed and returned to school by Friday, February 2nd. The Snow Ball Dance is Friday Feb. 9 and Parent Council has set up a Sign Up Genius page to coordinate help and donations. Please visit the Live Feed section of the Webpage for the link to the Sign Up Genius. Thank you. Lady Patriots win 16-15! Great job girls! Girls' Basketball Game tonight at vs Jackson Prep. Only one game. Come out and support the team! We came up a bit short of our goal for raising money to purchase the Chromebooks. Therefore, we are still accepting donations of ANY amount to help defer the cost. Thus far the Chromebooks have generated tremendous enthusiasm in school for learning from the students. Just a reminder that 6th grade book orders are due tomorrow by 8:00 AM. 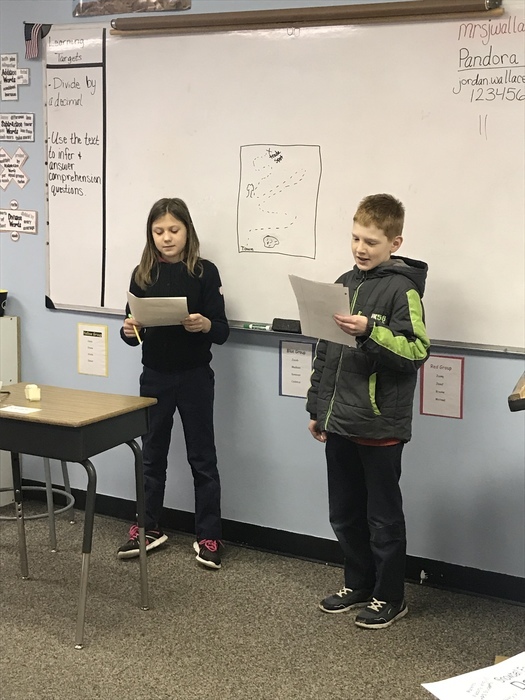 Here are a few more groups presenting their empire’s achievements. 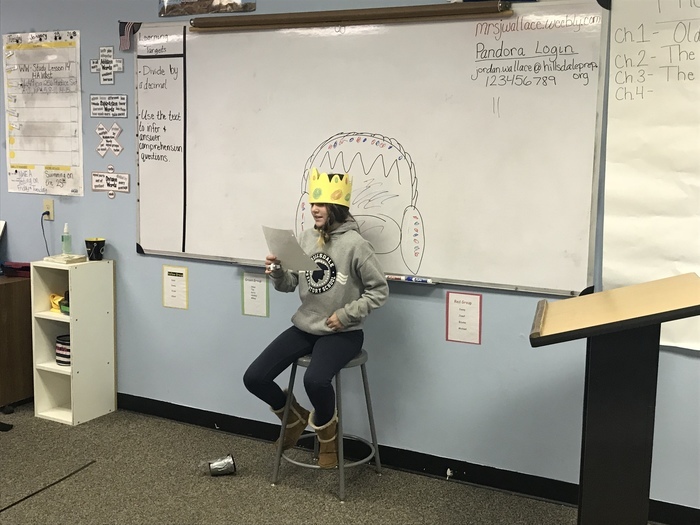 The 6th graders had a great time presenting their Mesopotamian Empire achievements. The 6th graders will be taking their NWEA Math test on Friday & Reading test on Tuesday. Please make sure your student gets plenty of rest the night before & has breakfast the mornings of testing. The winner of the canned food drive is....Mr. Fowler's 4th grade class! They donated 181 items. Overall we collected 846 items. Thank you for all of your donations. Everything will be donated to the food pantry at the Hillsdale Baptist Church. The 6th grade class still needs at least 2 chaperones for our field trip on February 8th. Please let Mrs. Wallace know if you can drive and chaperone as soon as possible. The goal for the PC canned food drive was 1001 items. At this time we are at about 700. PC has decided to extend the drive through Monday with the added incentive that Larry Sharp or Darrel Kratt will receive a "Pie in the Face" from the winning class next Friday. Please check out the article in "News" on our website regarding the Spirit Week that Student Council has planned for the end of the month. 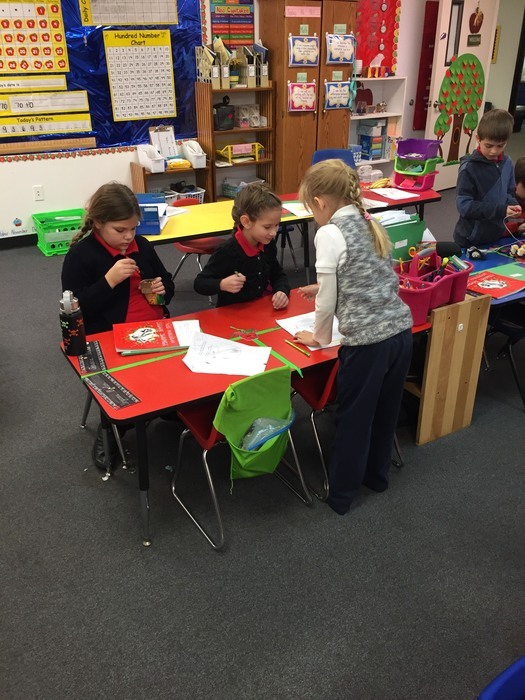 Mrs. Draheim's class is winning the canned food drive! Tomorrow is the last day to bring in your items. The final count will be done at lunch. The class that brings in the most items will win a prize from Parent Council. Tonight's Girls' Basketball game is being played at Mar Lee. Tonight is an away game and not a home game. We will be playing Mar Lee at Home on Jan 25. There will not be a Board Meeting this month. We will have a combined Jan. and Feb. meeting on Monday, February 5 at 5:00 PM. We are SO excited to have our Chromebooks! 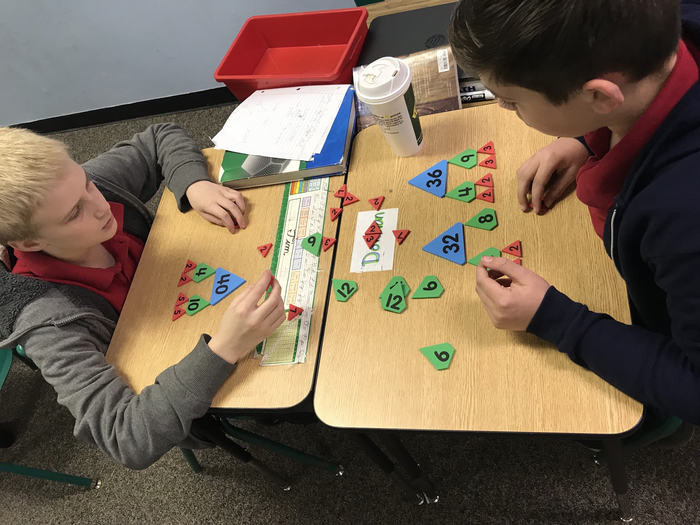 Ask your 2nd grader how they used them today to enhance their learning! Great news! Report cards are being sent home with students this afternoon. The Parent Council sponsored food drive begins today. Students can take non-perishable foods to their homeroom teacher. The classroom that brings in the most items will get a reward from parent council. There is Parent Council Meeting tonight at 6:15. The meeting minutes and agenda can be found on our website. 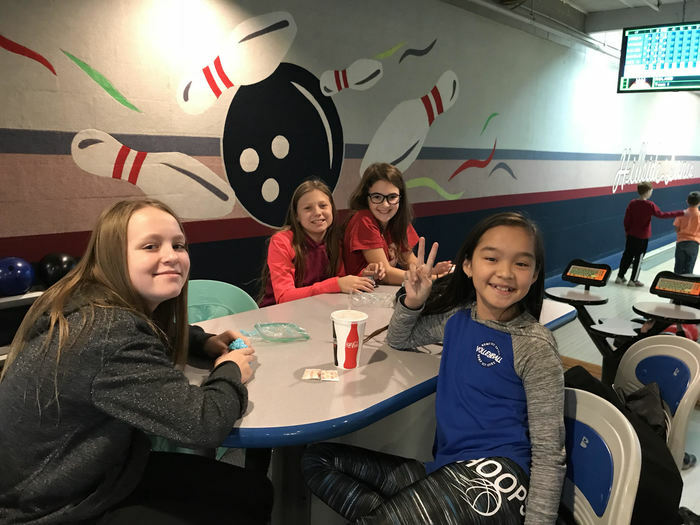 Please add these events to the Jan. Calendar: Bible Release: Jan. 22 Swimming(3rd-8th Grade): Jan. 25 You can find an updated copy of the calendar in the documents section of the website. A chaperone sheet for the 6th and 7th/8th grade field trip was sent home today. Chaperones will be chosen on a first come first serve basis. Thanks in advance for your help. School is closed for Monday, January 8 due to weather conditions. Hillsdale Preparatory School would like to wish all our students, parents and staff a very, very Merry Christmas and a fantastic New Year! Stay safe and enjoy the company of friends and family as you rest and refresh yourself during the holiday break. It has been a wonderful first semester with a second semester that promises to be even better! See you all next year! We only have nine McDonald's coupon sheets left! Today is your last chance to get a last minute gift for someone at work or a cool stocking stuffer. $5 gets you $30 worth of BOGO coupons! One free sandwich alone is almost $5!!! Papers and dioramas for the 6th grade reading class are due tomorrow. The 6th grade class will be going to the santa shop tomorrow to purchase items. Tuesday was Elf day. 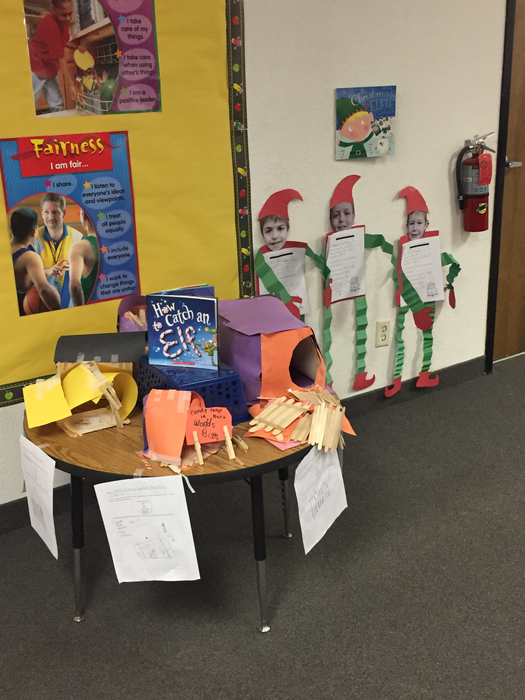 We "elfed" ourselves and worked with 4th grade to design and build elf traps. Today is Grinch day. 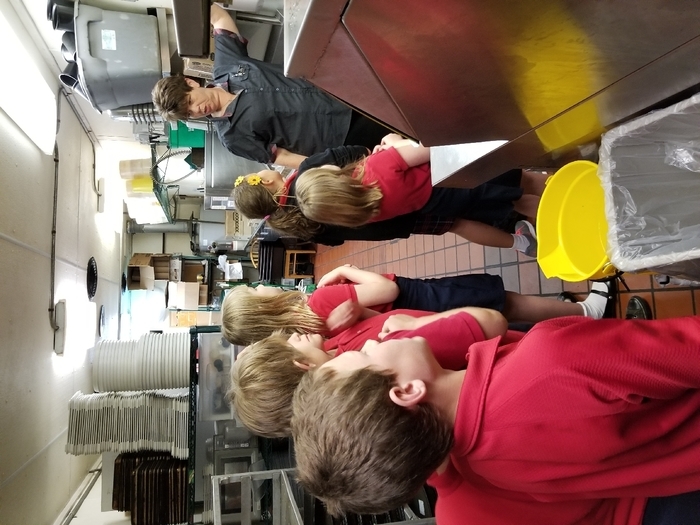 The 2nd graders are excited to find out what activities are in-store! The Christmas program was a big hit with everyone. All the kids looked so nice all dressed up or in costume. Thanks to everyone for coming and supporting the students' efforts. The "King" did indeed steal the show and now Elvis has left the building. Thank you very much. 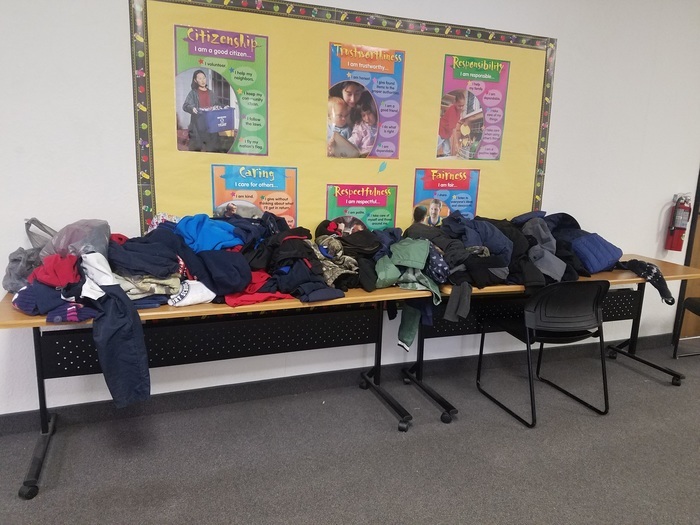 We have a huge pile of lost and found items! We will have a table set up in the art room during the concert. Make sure to look through the items before you leave. We can't wait to see everyone tonight. 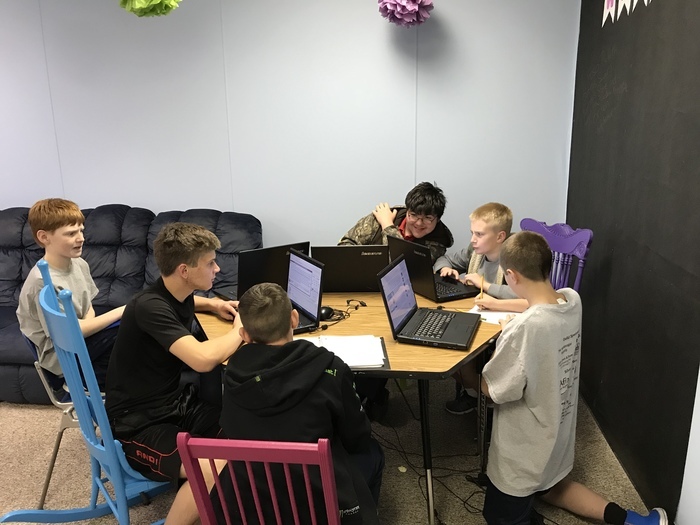 Check out the Chromebook article on our webpage! We are currently seeking donations, which are tax deductable (at least for 2017) to help cover the balance left on the Chromebook purchase. All the info in on the webpage. There is a copy of the Holiday Shop schedule in the documents section. It is in the parent information folder. Tonight's Christmas program begins at 6:30 sharp. See you then. For tonight's Christmas program students need to be here for practice by 5:30. They will meet in their classrooms until it is time for them to come to the gym. ALL HPS students are participating in the program. The thematic dress was for selected groups to go with their songs. 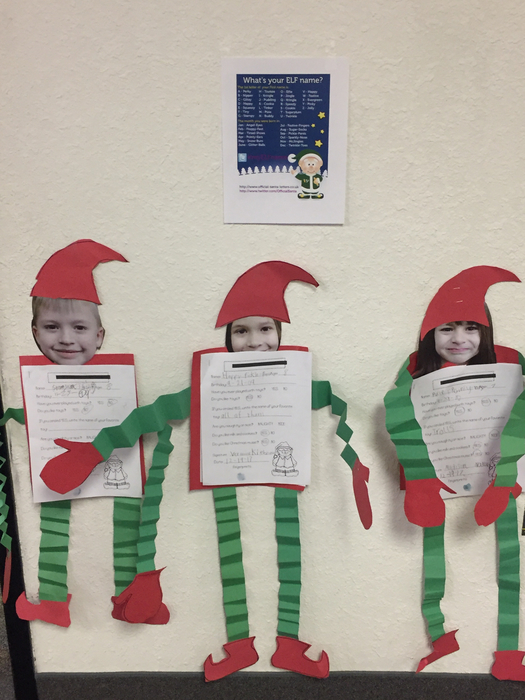 Mrs. Fowler's class had a blast working on some holiday related math stations today. 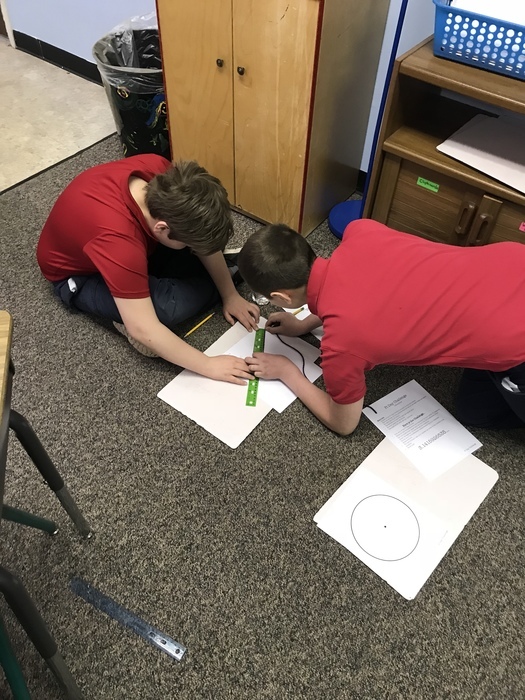 We reviewed missing addends, measuring to the nearest inch and fact families. Cheerleaders will cheer at the reacheduled games on Thursday. There is no practice on Wednesday. The 6th grade reading students will be creating a diorama for The Secret Garden. They will choose their favorite scene or an important scene to recreate. These are due on Friday the 22nd. Kids are having a great time at their dance. Student Council did a super job putting this together. Thanks to all the parents who helped out. We'll have to do this again! Do to the visiting teams having to reschedule their Christmas program Monday's basketball games have been moved to Thursday December 21st. The first game will start at 5:30. For Tuesday's Christmas concert formal dress is required. No jeans, no school uniform or shorts. Third grade formal wear should be something green. Fifth grade should be something blue. Sixth grade should be something tropical themed like slacks and a t shirt. Reminder: 3:30-5:30 tonight is the dance sponsored by Student Council. Cost is $1.00 and they can dress casually today. *Snacks will be provided. *Please come into the gym to pick up your child. Hillsdale Prep is closed today. 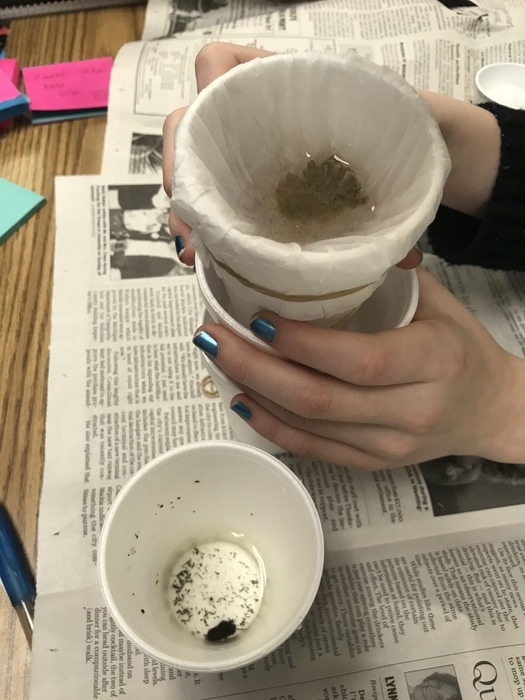 One group created their water purification system. There will be no cheerleading practice on Wednesday due to a staff meeting. We will not cheer at the game on Thursday. However, the girls wish to cheer at both games on Monday. If this is not possible for your daughter, please email me. On Wednesday, December 13 from 3:00 - 5:00 Mrs. Dickinson will be hanging decorations for the Christmas Program. Any one willing to help can meet her in the gym at that time. 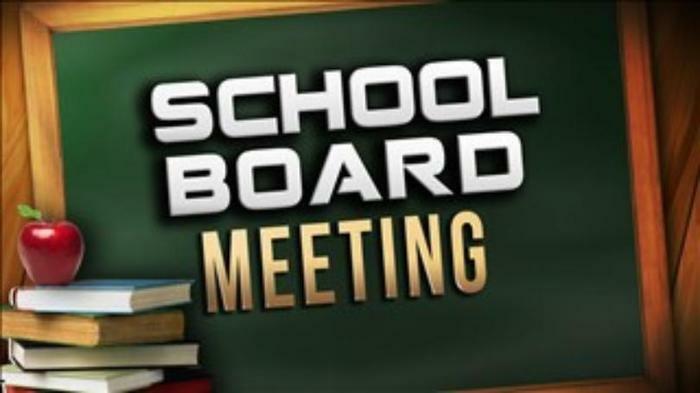 The HPS School Board wishes to remind all stakeholders that their meetings are open to the public and public comment is welcomed at the meetings. Student Council is sponsoring a dance on Friday, December 15th from 3:30-5:30. Students can purchase a ticket for $1.00 all this week. The ticket is their entrance into the dance and also allows them to wear casual clothes to school. We hope to see you there. December book orders are due today. We were able to earn 5 new books for our classroom library with last month's order. 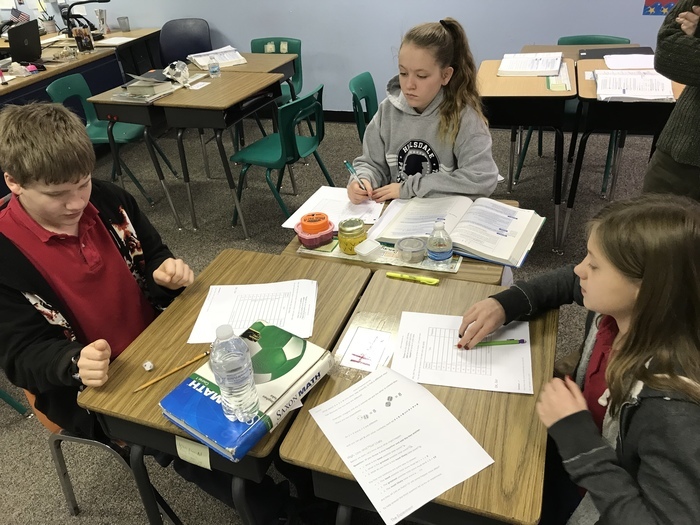 The 6th, 7th, and 8th graders were hard at work today researching information about water purification for their STEM project. HPS is looking for additional members for our School Improvement Steering Committee. See the "News" on our website for more information. Student Council has organized a caroling activity for Tuesday, December 12th. Students will be walking to Hillsdale County Medical Care Facility and singing to the residents. What a great way to spread holiday cheer. 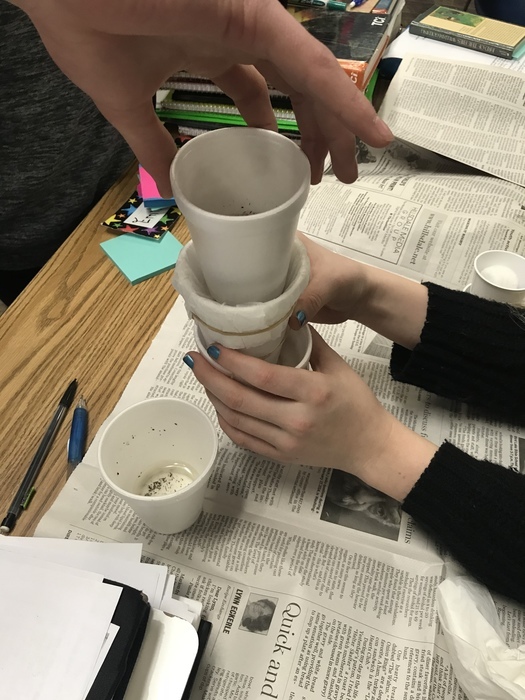 After reading Mike Mulligan and the Steam Shovel, students in our class are designing and building their own steam shovels. Look at those creative minds at work!!! Since the tonight's game was cancelled by Jackson Prep, the boys will practice until 4:30. This is not mandatory and they do not have to have practice clothes. Thank you. Jackson Prep just called and they cancelled our game for tonight. There is no basketball game tonight. Once again we will be able to make $5 for every sheet of coupons we sell during McTeacher night. These coupon sheets are a great value. You can easily recover your $5 in a visit to McDonald's! They make great stocking stuffers or even Secret Santa gifts. If you can't come Tuesday night, we will take advanced orders for the coupon sheets here at the school. Let's be sure to keep the McTeacher's night in mind for next Tuesday 4:30 - 7:00. We have a basketball that night so stop in for a pregame meal or take a night off from cooking after the game. Last year we raised a decent amount of money with an excellent turnout. Let's try to do even better this year. The December Calendar will be sent out early next week. All of our upcoming events are on the website. Cheerleaders- there will an additional practice on monday 12/4 until 4:30. Please plan attend. Game on 12/5 and regular practice 12/6. Just a reminder that 6th grade Scholastic book orders are due tomorrow. 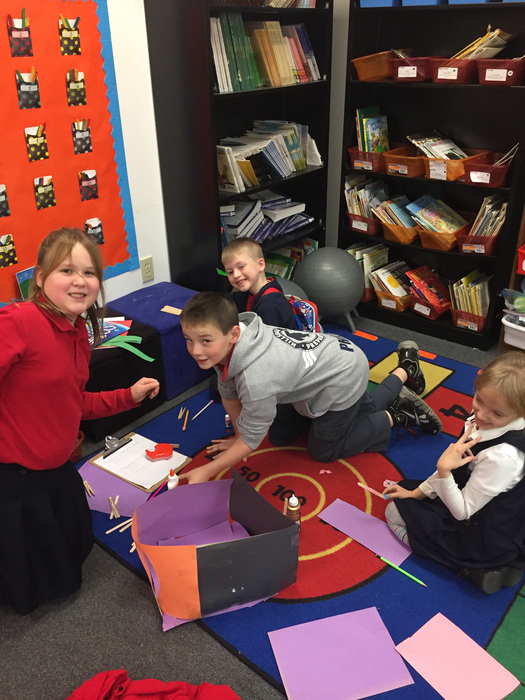 Parent Council is working on a float for the Light It Up Parade. Decorating will take place Friday 12/1 from 4-6pm. They would LOVE students and parents to come and help make the float spectacular! See you then!!!! Happy Thanksgiving to all HPS students, parents and staff! Enjoy the time off with family and friends! Mrs. Medrano's Kindergartners received an extra special surprise today! Mrs. Keihnau brought in her children's collection of legos to share at break time! It was wonderful and everyone loved it! We would like to thank Mrs. Keihnau for this special opportunity!! 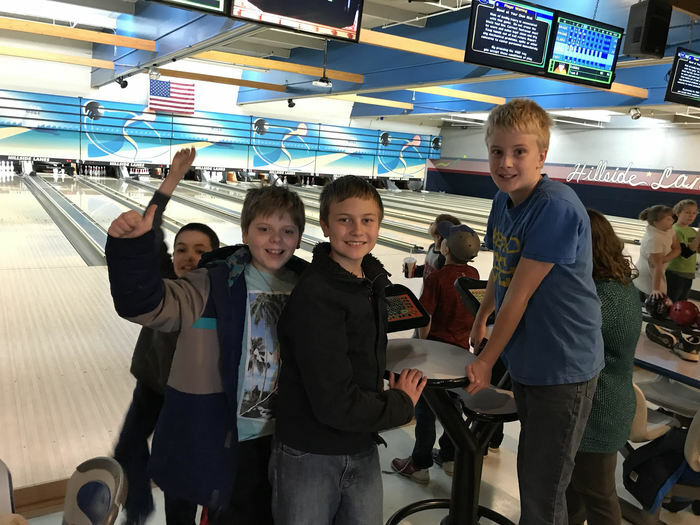 The 6th graders had a blast bowling last week. To my students and parents have a wonderful Thanksgiving. We want to thank the Parent Council and the parents who worked Tuesday for the Thanksgiving Breakfast. 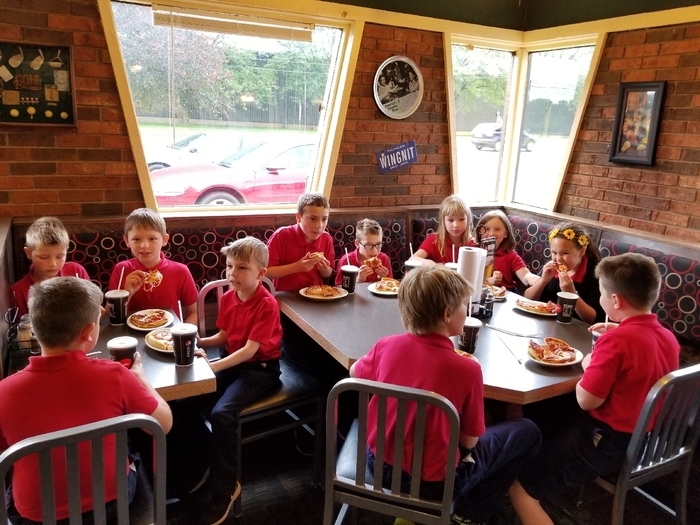 The kids ate well and enjoyed the food! I also know of a lot of moms and dads that were "thankful" they did not have to pack lunch on Tuesday! Tomorrow is a half day of school! We will dismiss students at 12:00. There will be no lunch and no after school. Please arrange for your child to be picked up at 12:00. We still need parents to help cook tomorrow. We will begin making the french toast at 10:00 in the gym. Tomorrow is our Thanksgiving Breakfast! We will be serving french toast and sausage for lunch. Students do not need to pack a lunch. Any cheerleaders (including those from the clinic) that have tshirts with peeling letters may bring them to me on Monday for a replacement. Please put the shirt in a bag labeled with the child's name. New shirts will be delivered after Thanksgiving. Bowling was.a Huge Hit with the kids! Just a few reminders: Tomorrow is 3rd-8th grade swimming. 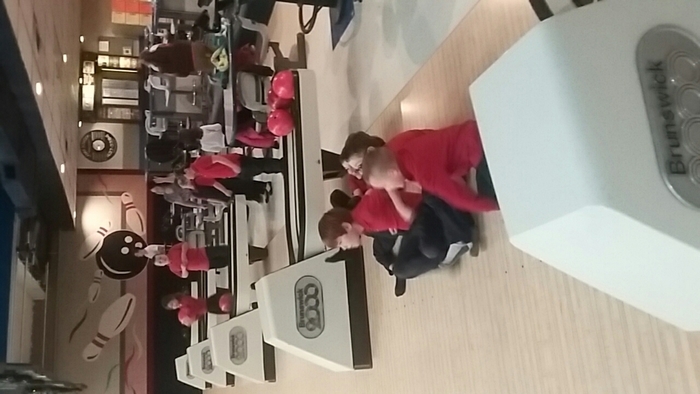 Tomorrow is k-2 bowling for those who qualified. Friday is 3-8 bowling for those who qualified. 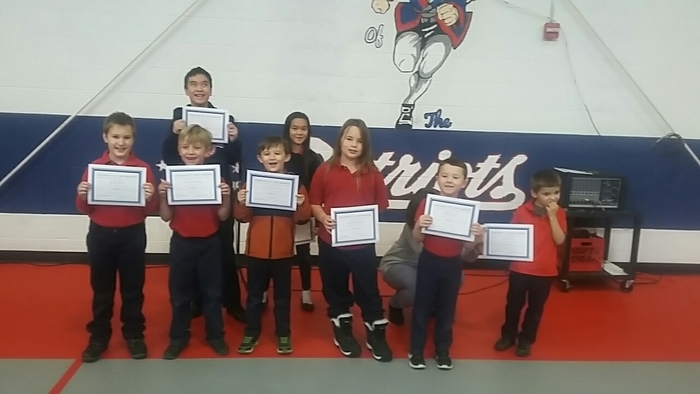 The Students of the Month for October were recognized this morning for "Perseverance"! Cheerleaders- There will be no game on Wednesday 11/15. We will have practice from 3:30-4:30 that day instead. See you then! Just wanted to send you a test message to make sure we have you on the list. 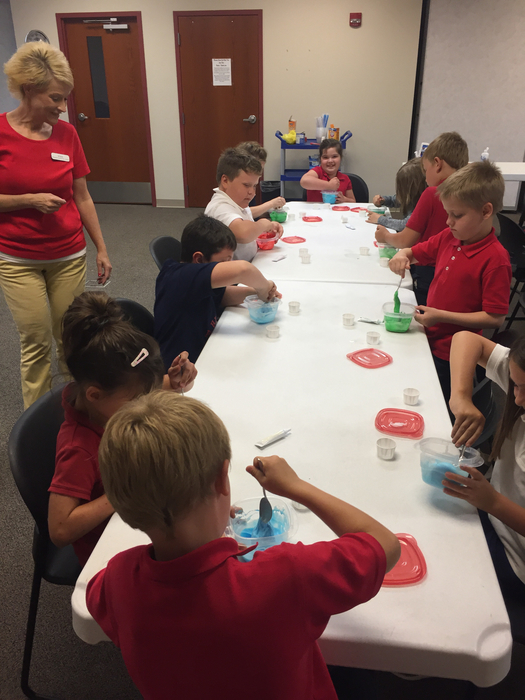 Mrs. Wallace’s class is starting a new atom project in science. Students were given a letter to take home today explaining the project. Projects are due Tuesday, November 14. School pictures are in! They will be sent home today. 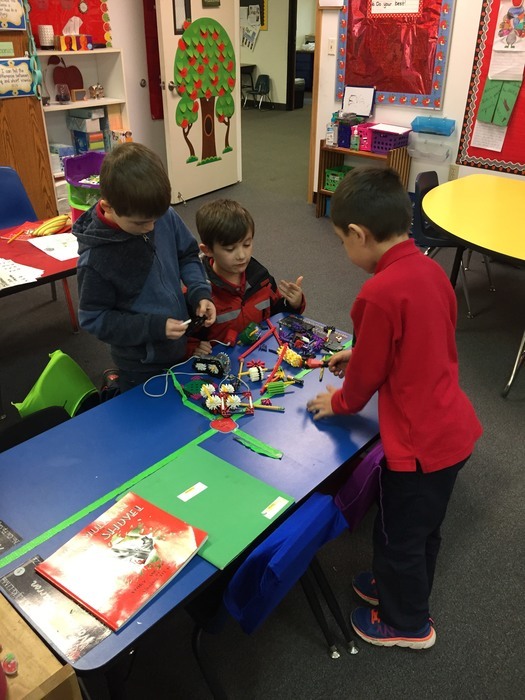 Mrs. Fowler needs a parent volunteer for the newly formed Robotics Team. If interested contact her or call the school for more info. HPS Parents! Our new website and mobile application is LIVE! Please go to the Apple Store or Google Play and search for “Hillsdale Prep” to download the mobile app from Apptegy. From now on this will be where you will find our calendar and HPS news. Stay tuned for more “live feeds” as we keep you informed via text and email. If you have any questions or need some assistance or just want me to demonstrate some of the features, just stop in the office and I will be happy to sit and show you all the things we can do with the new communication system. Mr. B. Do you like our new website? Download the app for your mobile devices! Search your app store for Hillsdale Prep.